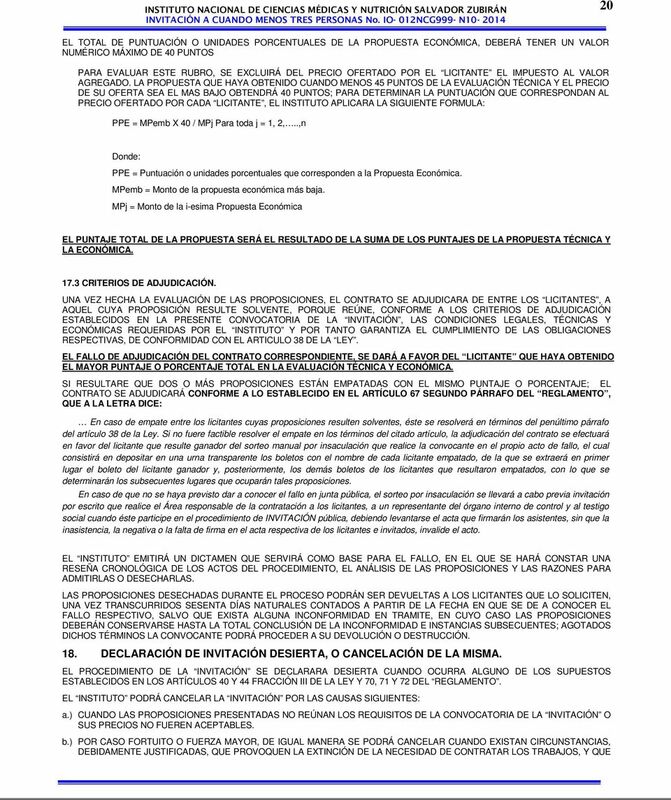 Download "CONVOCATORIA DEL PROCEDIMIENTO DE CONTRATACIÓN MEDIANTE:"
1 INSTITUTO NACIONAL DE CIENCIAS MÉDICAS Y NUTRICIÓN SALVADOR ZUBIRÁN DIRECCIÓN DE ADMINISTRACIÓN SUBDIRECCIÓN DE RECURSOS MATERIALES Y SERVICIOS GENERALES CONVOCATORIA DEL PROCEDIMIENTO DE CONTRATACIÓN MEDIANTE: INVITACIÓN A CUANDO MENOS TRES PERSONAS Nº IO-012NCG999-N PARA LA ADJUDICACIÓN DE UN CONTRATO DE SERVICIOS RELACIONADOS CON OBRA PÚBLICA A PRECIOS UNITARIOS Y TIEMPO DETERMINADO. 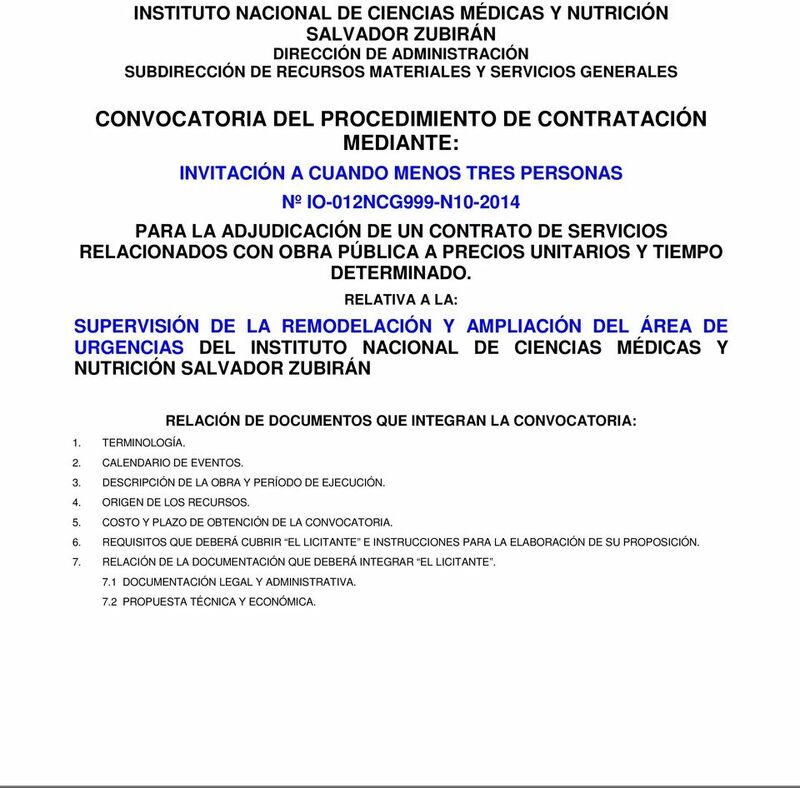 RELATIVA A LA: SUPERVISIÓN DE LA REMODELACIÓN Y AMPLIACIÓN DEL ÁREA DE URGENCIAS DEL INSTITUTO NACIONAL DE CIENCIAS MÉDICAS Y NUTRICIÓN SALVADOR ZUBIRÁN RELACIÓN DE DOCUMENTOS QUE INTEGRAN LA CONVOCATORIA: 1. TERMINOLOGÍA. 2. CALENDARIO DE EVENTOS. 3. DESCRIPCIÓN DE LA OBRA Y PERÍODO DE EJECUCIÓN. 4. ORIGEN DE LOS RECURSOS. 5. COSTO Y PLAZO DE OBTENCIÓN DE LA CONVOCATORIA. 6. REQUISITOS QUE DEBERÁ CUBRIR EL LICITANTE E INSTRUCCIONES PARA LA ELABORACIÓN DE SU PROPOSICIÓN. 7. RELACIÓN DE LA DOCUMENTACIÓN QUE DEBERÁ INTEGRAR EL LICITANTE. 7.1 DOCUMENTACIÓN LEGAL Y ADMINISTRATIVA. 7.2 PROPUESTA TÉCNICA Y ECONÓMICA. 2 2 8. ASPECTOS ECONÓMICOS. 8.1 CONDICIONES DE PAGO QUE SE APLICARÁN. 8.2 CRITERIOS QUE SE OBSERVARÁN EN EL PAGO DE ESTIMACIONES. 8.3 CONDICIONES DE PAGO. 8.4 EXIGIBILIDAD DEL PAGO. 9. ANTICIPOS. 10. AJUSTE COSTOS. 11. IMPUESTOS, DERECHOS Y OBLIGACIONES. 12. IMPUESTO AL VALOR AGREGADO. 13. GARANTÍAS GARANTÍA RELATIVA AL CUMPLIMIENTO DEL CONTRATO Y CALIDAD DE LOS TRABAJOS RESPONSABILIDAD CIVIL. 14. VISITA AL SITIO DE REALIZACIÓN DE LOS TRABAJOS. 15. JUNTA DE ACLARACIONES. 16. ACTO DE PRESENTACIÓN Y APERTURA DE PROPOSICIONES INDICACIONES GENERALES APERTURA DE PROPOSICIONES. 17. CRITERIOS DE EVALUACIÓN Y ADJUDICACIÓN CRITERIOS DE EVALUACIÓN 17.2 CRITERIOS DE ADJUDICACIÓN 18. DECLARACIÓN DE LA INVITACIÓN A CUANDO MENOS TRES PERSONAS DESIERTA, O CANCELACIÓN DE LA MISMA. 19. FALLO. 20. FORMALIZACIÓN DEL CONTRATO. 21. MODIFICACIONES AL CONTRATO. 22. PENAS CONVENCIONALES POR ATRASO EN LOS PROGRAMAS POR CAUSAS IMPUTABLES AL CONTRATISTA. 23. SUSPENSIÓN, TERMINACIÓN ANTICIPADA DEL CONTRATO Y RESCISIÓN ADMINISTRATIVA. 24. CASOS EN QUE SE APLICARÁN LAS GARANTÍAS. 25. INCONFORMIDADES, CONTROVERSIAS Y TRANSPARENCIA INCONFORMIDADES CONTROVERSIAS TRANSPARENCIA. ANEXOS 1) INFORMACIÓN PARA ACREDITAR LA PERSONALIDAD DE LOS LICITANTES. 2) FORMATO PARA LA MANIFESTACIÓN ESCRITA BAJO PROTESTA DE DECIR VERDAD DE NO ENCONTRARSE EN LOS SUPUESTOS PREVISTOS EN LOS ARTÍCULOS 51 Y 78 DE LA LEY DE OBRAS PÚBLICAS Y SERVICIOS RELACIONADOS CON LAS MISMAS. 3) FORMATO PARA LA DECLARACIÓN DE INTEGRIDAD. 4) FORMATO PARA LA MANIFESTACIÓN DE NACIONALIDAD MEXICANA. 5) FORMATO CONSTANCIA DE VISITA AL SITIO. 6) FORMATO RELACIÓN DE EQUIPO E INSTRUMENTOS CIENTÍFICOS. 7) MODELO DE CONTRATO. 8) TÉRMINOS DE REFERENCIA DEL SERVICIO DE SUPERVISIÓN DE OBRA Y DE PROYECTO. 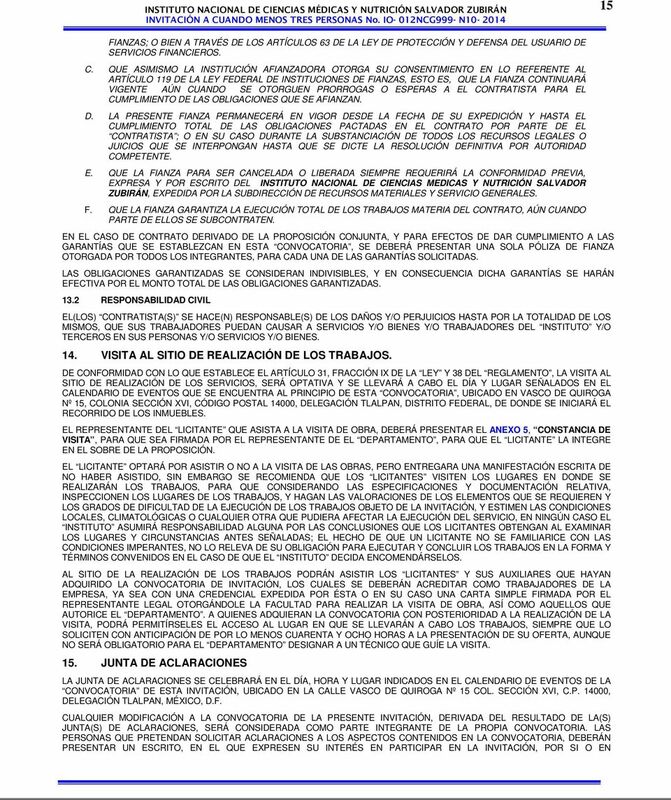 9) CARTA COMPROMISO DE LA PROPOSICIÓN. 10) FORMATO DE ANÁLISIS DE PRECIO UNITARIO. 3 3 11) FORMATO TABULADOR DE SALARIOS BASE. 12) FORMATO COSTOS HORARIO DE EQUIPO E INSTRUMENTOS CIENTÍFICOS. 13) FORMATO COSTOS INDIRECTOS. 14) FORMATO COSTOS DE FINANCIAMIENTO. 15) FORMATO DE MANIFESTACIÓN DE LA UTILIDAD DE LA PROPOSICIÓN. 16) FORMATO DE REGISTRO PYMES. 17) CATALOGO DE CONCEPTOS. 18) FORMATO DEL PROGRAMA DE EROGACIONES Y AVANCES DE LA EJECUCIÓN DEL SERVICIO. 19) FORMATO DE PROGRAMAS DE EROGACIONES DE: a.) DE LA UTILIZACIÓN DE EQUIPO E INSTRUMENTOS CIENTÍFICOS. b.) DE LA UTILIZACIÓN DE LA MANO DE OBRA DIRECTA RESPONSABLE DEL SERVICIO. 20) ENCUESTA DE TRANSPARENCIA. 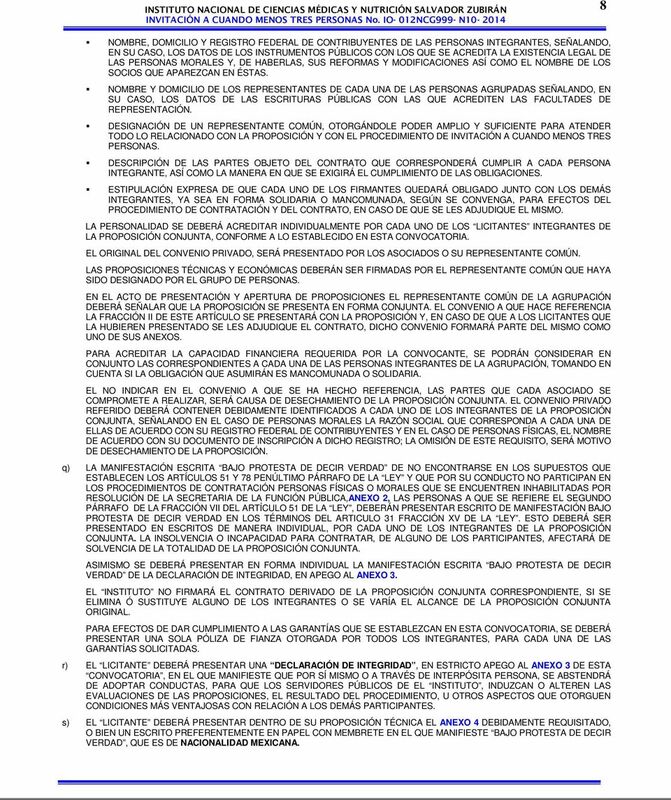 21) FORMATO DE RECEPCIÓN DE DOCUMENTOS. 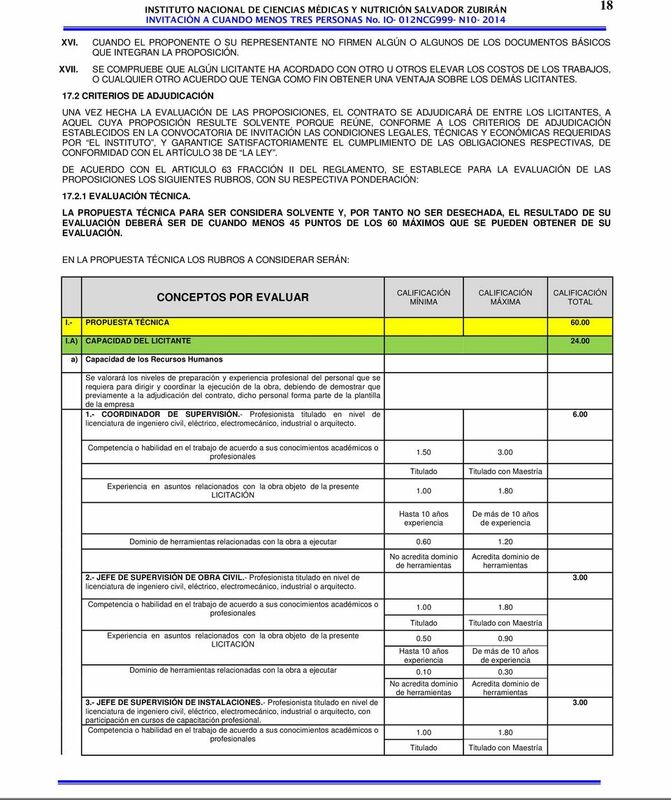 4 4 INSTITUTO NACIONAL DE CIENCIAS MÉDICAS Y NUTRICIÓN SALVADOR ZUBIRÁN DIRECCIÓN DE ADMINISTRACIÓN SUBDIRECCIÓN DE RECURSOS MATERIALES Y SERVICIOS GENERALES C O N V O C A T O R I A PARA EL PROCEDIMIENTO DE CONTRATACIÓN MEDIANTE INVITACIÓN A CUANDO MENOS TRES PERSONAS Nº IO-012NCG999-N RELATIVA AL SERVICIO RELACIONADO CON OBRA CONSISTENTE EN LA SUPERVISIÓN DE LA REMODELACIÓN Y AMPLIACIÓN DEL ÁREA DE URGENCIAS DEL INSTITUTO NACIONAL DE CIENCIAS MÉDICAS Y NUTRICIÓN SALVADOR ZUBIRÁN, A PRECIO UNITARIOS Y TIEMPO DETERMINADO. EN CUMPLIMIENTO DE LAS DISPOSICIONES QUE ESTABLECE EL ARTÍCULO 134 DE LA CONSTITUCIÓN POLÍTICA DE LOS ESTADOS UNIDOS MEXICANOS, ARTÍCULOS 4, 27 FRACCIÓN II, 41 Y 43 DELA LEY DE OBRAS PÚBLICAS Y SERVICIOS RELACIONADOS CON LAS MISMAS, EL REGLAMENTO DE LA LEY DE OBRAS PÚBLICAS Y SERVICIOS RELACIONADOS CON LAS MISMAS, Y DEMÁS DISPOSICIONES APLICABLES, EL INSTITUTO NACIONAL DE CIENCIAS MÉDICAS Y NUTRICIÓN SALVADOR ZUBIRÁN, A TRAVÉS DE LA SUBDIRECCIÓN DE RECURSOS MATERIALES Y SERVICIOS GENERALES Y EL DEPARTAMENTO DE CONSERVACIÓN Y CONSTRUCCIÓN, AMBOS UBICADOS DENTRO DEL INSTITUTO, EN CALLE VASCO DE QUIROGA Nº 15, COL. SECCIÓN XVI, C.P , DELEGACIÓN TLALPAN, MÉXICO, D.F., TELÉFONO EXT. 7003, Y CORREO ELECTRÓNICO EMITE LA SIGUIENTE CONVOCATORIA. 1. TERMINOLOGÍA. PARA LOS EFECTOS DE ESTA CONVOCATORIA SE ENTENDERÁ POR: LEY Ó LOPSRM REGLAMENTO SHCP SAT INSTITUTO SFP DIRECCIÓN SUBDIRECCIÓN DEPARTAMENTO RESIDENTE DE OBRA CONVOCANTE LEY DE OBRAS PÚBLICAS Y SERVICIOS RELACIONADOS CON LAS MISMAS, ASÍ COMO SUS REFORMAS Y ADICIONES PUBLICADAS EN EL DIARIO OFICIAL DE LA FEDERACIÓN EL 09 DE ABRIL DEL REGLAMENTO DE LA LEY DE OBRAS PÚBLICAS Y SERVICIOS RELACIONADOS CON LAS MISMAS, ASÍ COMO SUS REFORMAS Y ADICIONES PUBLICADAS EN EL DIARIO OFICIAL DE LA FEDERACIÓN EL 28 DE JULIO DE SECRETARÍA DE HACIENDA Y CRÉDITO PÚBLICO. SERVICIO DE ADMINISTRACIÓN TRIBUTARIA. INSTITUTO NACIONAL DE CIENCIAS MEDICAS Y NUTRICIÓN SALVADOR ZUBIRÁN. SECRETARÍA DE LA FUNCIÓN PÚBLICA. DIRECCIÓN DE ADMINISTRACIÓN. DEL INSTITUTO. 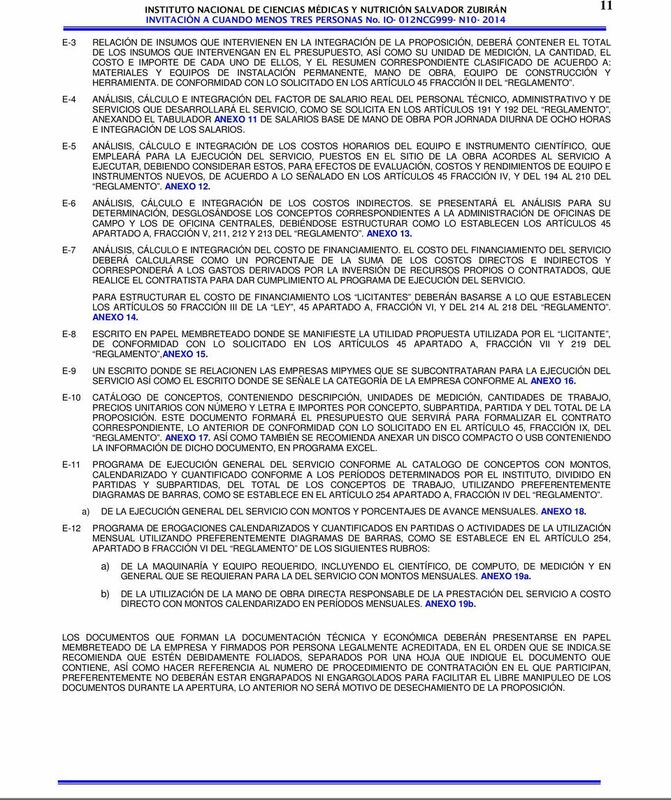 SUBDIRECCIÓN DE RECURSOS MATERIALES Y SERVICIOS GENERALES. DEL INSTITUTO. DEPARTAMENTO CONSERVACIÓN Y CONSTRUCCIÓN DEL INSTITUTO. 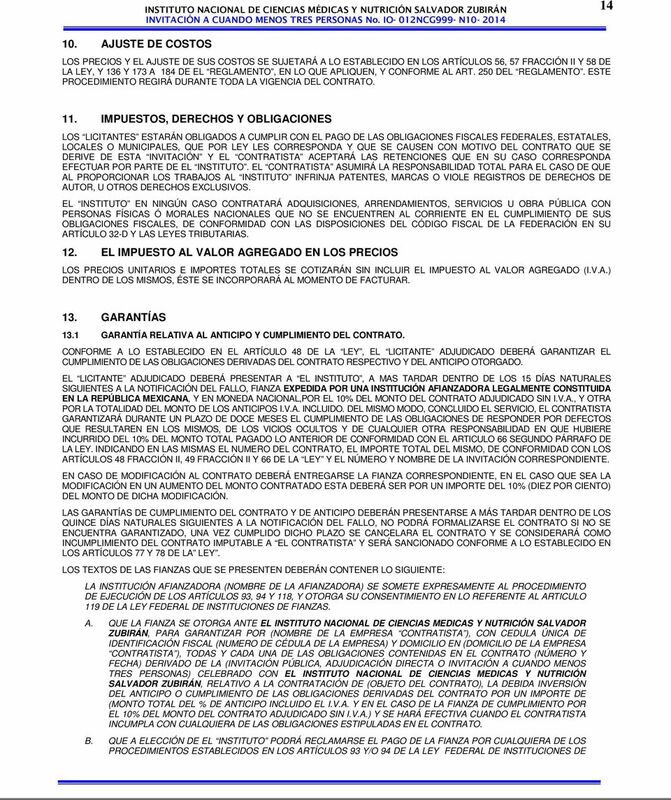 TITULAR DEL DEPARTAMENTO CON LAS FUNCIONES ESTABLECIDAS EN LOS ARTÍCULOS 112 Y 113 DEL REGLAMENTO. INSTITUTO NACIONAL DE CIENCIAS MEDICAS Y NUTRICIÓN SALVADOR ZUBIRÁN. LICITANTE(S) CUALQUIER PERSONA FÍSICA O MORAL QUE PARTICIPE EN EL PRESENTE PROCEDIMIENTO DE CONTRATACIÓN. CONTRATISTA INVITACIÓN PERSONA FÍSICA O MORAL QUE CELEBRE CONTRATO DE OBRA PÚBLICA O DE SERVICIOS RELACIONADOS CON LAS MISMAS. INVITACIÓN A CUANDO MENOS TRES PERSONAS. 6 6 PARTICIPAR EN EL PROCEDIMIENTO DE CONTRATACIÓN AQUÉLLAS PERSONAS QUE HAYAN SIDO INVITADAS POR LA DEPENDENCIA O ENTIDAD, LO ANTERIOR DE CONFORMIDAD A LO SEÑALADO EN EL ARTÍCULO 77 DEL REGLAMENTO. EL INSTITUTO PROPORCIONARÁ LOS PLANOS DEL ANTEPROYECTO EN EL DEPARTAMENTO DE CONSERVACIÓN Y CONSTRUCCIÓN, O BIEN VÍA CORREO ELECTRÓNICO, EN LA SIGUIENTE DIRECCIÓN 6. 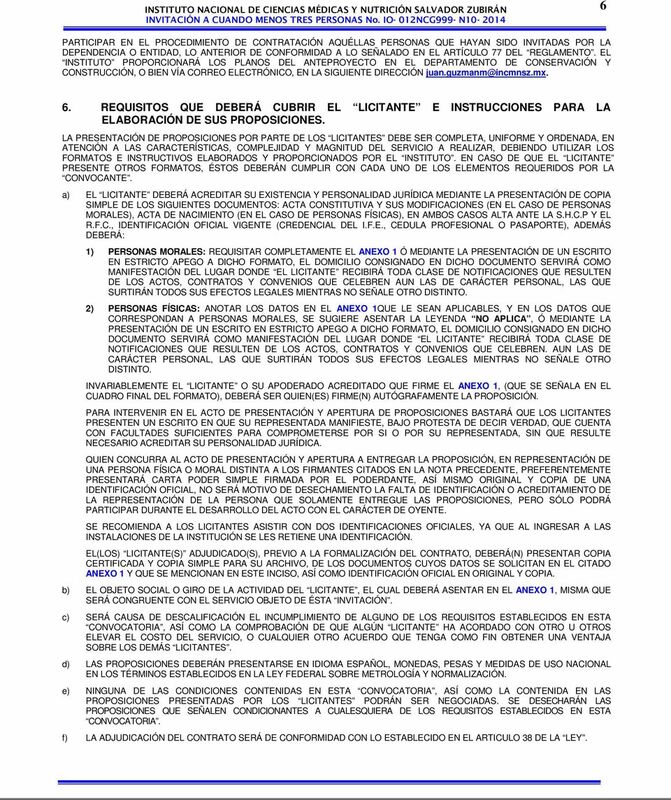 REQUISITOS QUE DEBERÁ CUBRIR EL LICITANTE E INSTRUCCIONES PARA LA ELABORACIÓN DE SUS PROPOSICIONES. LA PRESENTACIÓN DE PROPOSICIONES POR PARTE DE LOS LICITANTES DEBE SER COMPLETA, UNIFORME Y ORDENADA, EN ATENCIÓN A LAS CARACTERÍSTICAS, COMPLEJIDAD Y MAGNITUD DEL SERVICIO A REALIZAR, DEBIENDO UTILIZAR LOS FORMATOS E INSTRUCTIVOS ELABORADOS Y PROPORCIONADOS POR EL INSTITUTO. EN CASO DE QUE EL LICITANTE PRESENTE OTROS FORMATOS, ÉSTOS DEBERÁN CUMPLIR CON CADA UNO DE LOS ELEMENTOS REQUERIDOS POR LA CONVOCANTE. a) EL LICITANTE DEBERÁ ACREDITAR SU EXISTENCIA Y PERSONALIDAD JURÍDICA MEDIANTE LA PRESENTACIÓN DE COPIA SIMPLE DE LOS SIGUIENTES DOCUMENTOS: ACTA CONSTITUTIVA Y SUS MODIFICACIONES (EN EL CASO DE PERSONAS MORALES), ACTA DE NACIMIENTO (EN EL CASO DE PERSONAS FÍSICAS), EN AMBOS CASOS ALTA ANTE LA S.H.C.P Y EL R.F.C., IDENTIFICACIÓN OFICIAL VIGENTE (CREDENCIAL DEL I.F.E., CEDULA PROFESIONAL O PASAPORTE), ADEMÁS DEBERÁ: 1) PERSONAS MORALES: REQUISITAR COMPLETAMENTE EL ANEXO 1 Ó MEDIANTE LA PRESENTACIÓN DE UN ESCRITO EN ESTRICTO APEGO A DICHO FORMATO, EL DOMICILIO CONSIGNADO EN DICHO DOCUMENTO SERVIRÁ COMO MANIFESTACIÓN DEL LUGAR DONDE EL LICITANTE RECIBIRÁ TODA CLASE DE NOTIFICACIONES QUE RESULTEN DE LOS ACTOS, CONTRATOS Y CONVENIOS QUE CELEBREN AUN LAS DE CARÁCTER PERSONAL, LAS QUE SURTIRÁN TODOS SUS EFECTOS LEGALES MIENTRAS NO SEÑALE OTRO DISTINTO. 2) PERSONAS FÍSICAS: ANOTAR LOS DATOS EN EL ANEXO 1QUE LE SEAN APLICABLES, Y EN LOS DATOS QUE CORRESPONDAN A PERSONAS MORALES, SE SUGIERE ASENTAR LA LEYENDA NO APLICA, Ó MEDIANTE LA PRESENTACIÓN DE UN ESCRITO EN ESTRICTO APEGO A DICHO FORMATO, EL DOMICILIO CONSIGNADO EN DICHO DOCUMENTO SERVIRÁ COMO MANIFESTACIÓN DEL LUGAR DONDE EL LICITANTE RECIBIRÁ TODA CLASE DE NOTIFICACIONES QUE RESULTEN DE LOS ACTOS, CONTRATOS Y CONVENIOS QUE CELEBREN. AUN LAS DE CARÁCTER PERSONAL, LAS QUE SURTIRÁN TODOS SUS EFECTOS LEGALES MIENTRAS NO SEÑALE OTRO DISTINTO. INVARIABLEMENTE EL LICITANTE O SU APODERADO ACREDITADO QUE FIRME EL ANEXO 1, (QUE SE SEÑALA EN EL CUADRO FINAL DEL FORMATO), DEBERÁ SER QUIEN(ES) FIRME(N) AUTÓGRAFAMENTE LA PROPOSICIÓN. PARA INTERVENIR EN EL ACTO DE PRESENTACIÓN Y APERTURA DE PROPOSICIONES BASTARÁ QUE LOS LICITANTES PRESENTEN UN ESCRITO EN QUE SU REPRESENTADA MANIFIESTE, BAJO PROTESTA DE DECIR VERDAD, QUE CUENTA CON FACULTADES SUFICIENTES PARA COMPROMETERSE POR SI O POR SU REPRESENTADA, SIN QUE RESULTE NECESARIO ACREDITAR SU PERSONALIDAD JURÍDICA. QUIEN CONCURRA AL ACTO DE PRESENTACIÓN Y APERTURA A ENTREGAR LA PROPOSICIÓN, EN REPRESENTACIÓN DE UNA PERSONA FÍSICA O MORAL DISTINTA A LOS FIRMANTES CITADOS EN LA NOTA PRECEDENTE, PREFERENTEMENTE PRESENTARÁ CARTA PODER SIMPLE FIRMADA POR EL PODERDANTE, ASÍ MISMO ORIGINAL Y COPIA DE UNA IDENTIFICACIÓN OFICIAL, NO SERÁ MOTIVO DE DESECHAMIENTO LA FALTA DE IDENTIFICACIÓN O ACREDITAMIENTO DE LA REPRESENTACIÓN DE LA PERSONA QUE SOLAMENTE ENTREGUE LAS PROPOSICIONES, PERO SÓLO PODRÁ PARTICIPAR DURANTE EL DESARROLLO DEL ACTO CON EL CARÁCTER DE OYENTE. SE RECOMIENDA A LOS LICITANTES ASISTIR CON DOS IDENTIFICACIONES OFICIALES, YA QUE AL INGRESAR A LAS INSTALACIONES DE LA INSTITUCIÓN SE LES RETIENE UNA IDENTIFICACIÓN. EL(LOS) LICITANTE(S) ADJUDICADO(S), PREVIO A LA FORMALIZACIÓN DEL CONTRATO, DEBERÁ(N) PRESENTAR COPIA CERTIFICADA Y COPIA SIMPLE PARA SU ARCHIVO, DE LOS DOCUMENTOS CUYOS DATOS SE SOLICITAN EN EL CITADO ANEXO 1 Y QUE SE MENCIONAN EN ESTE INCISO, ASÍ COMO IDENTIFICACIÓN OFICIAL EN ORIGINAL Y COPIA. b) EL OBJETO SOCIAL O GIRO DE LA ACTIVIDAD DEL LICITANTE, EL CUAL DEBERÁ ASENTAR EN EL ANEXO 1, MISMA QUE SERÁ CONGRUENTE CON EL SERVICIO OBJETO DE ÉSTA INVITACIÓN. c) SERÁ CAUSA DE DESCALIFICACIÓN EL INCUMPLIMIENTO DE ALGUNO DE LOS REQUISITOS ESTABLECIDOS EN ESTA CONVOCATORIA, ASÍ COMO LA COMPROBACIÓN DE QUE ALGÚN LICITANTE HA ACORDADO CON OTRO U OTROS ELEVAR EL COSTO DEL SERVICIO, O CUALQUIER OTRO ACUERDO QUE TENGA COMO FIN OBTENER UNA VENTAJA SOBRE LOS DEMÁS LICITANTES. d) LAS PROPOSICIONES DEBERÁN PRESENTARSE EN IDIOMA ESPAÑOL, MONEDAS, PESAS Y MEDIDAS DE USO NACIONAL EN LOS TÉRMINOS ESTABLECIDOS EN LA LEY FEDERAL SOBRE METROLOGÍA Y NORMALIZACIÓN. e) NINGUNA DE LAS CONDICIONES CONTENIDAS EN ESTA CONVOCATORIA, ASÍ COMO LA CONTENIDA EN LAS PROPOSICIONES PRESENTADAS POR LOS LICITANTES PODRÁN SER NEGOCIADAS. 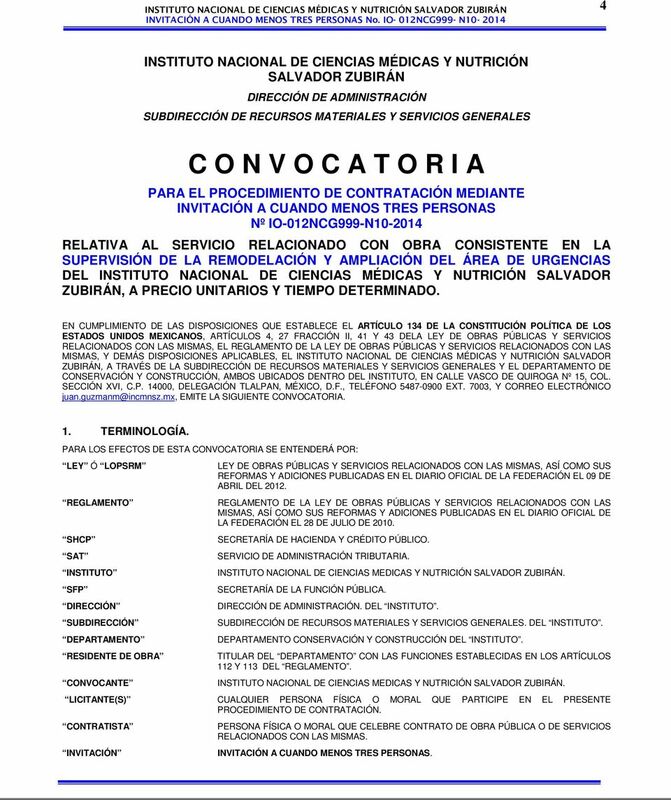 SE DESECHARÁN LAS PROPOSICIONES QUE SEÑALEN CONDICIONANTES A CUALESQUIERA DE LOS REQUISITOS ESTABLECIDOS EN ESTA CONVOCATORIA. f) LA ADJUDICACIÓN DEL CONTRATO SERÁ DE CONFORMIDAD CON LO ESTABLECIDO EN EL ARTICULO 38 DE LA LEY. 8 8 NOMBRE, DOMICILIO Y REGISTRO FEDERAL DE CONTRIBUYENTES DE LAS PERSONAS INTEGRANTES, SEÑALANDO, EN SU CASO, LOS DATOS DE LOS INSTRUMENTOS PÚBLICOS CON LOS QUE SE ACREDITA LA EXISTENCIA LEGAL DE LAS PERSONAS MORALES Y, DE HABERLAS, SUS REFORMAS Y MODIFICACIONES ASÍ COMO EL NOMBRE DE LOS SOCIOS QUE APAREZCAN EN ÉSTAS. NOMBRE Y DOMICILIO DE LOS REPRESENTANTES DE CADA UNA DE LAS PERSONAS AGRUPADAS SEÑALANDO, EN SU CASO, LOS DATOS DE LAS ESCRITURAS PÚBLICAS CON LAS QUE ACREDITEN LAS FACULTADES DE REPRESENTACIÓN. DESIGNACIÓN DE UN REPRESENTANTE COMÚN, OTORGÁNDOLE PODER AMPLIO Y SUFICIENTE PARA ATENDER TODO LO RELACIONADO CON LA PROPOSICIÓN Y CON EL PROCEDIMIENTO DE INVITACIÓN A CUANDO MENOS TRES PERSONAS. DESCRIPCIÓN DE LAS PARTES OBJETO DEL CONTRATO QUE CORRESPONDERÁ CUMPLIR A CADA PERSONA INTEGRANTE, ASÍ COMO LA MANERA EN QUE SE EXIGIRÁ EL CUMPLIMIENTO DE LAS OBLIGACIONES. ESTIPULACIÓN EXPRESA DE QUE CADA UNO DE LOS FIRMANTES QUEDARÁ OBLIGADO JUNTO CON LOS DEMÁS INTEGRANTES, YA SEA EN FORMA SOLIDARIA O MANCOMUNADA, SEGÚN SE CONVENGA, PARA EFECTOS DEL PROCEDIMIENTO DE CONTRATACIÓN Y DEL CONTRATO, EN CASO DE QUE SE LES ADJUDIQUE EL MISMO. LA PERSONALIDAD SE DEBERÁ ACREDITAR INDIVIDUALMENTE POR CADA UNO DE LOS LICITANTES INTEGRANTES DE LA PROPOSICIÓN CONJUNTA, CONFORME A LO ESTABLECIDO EN ESTA CONVOCATORIA. EL ORIGINAL DEL CONVENIO PRIVADO, SERÁ PRESENTADO POR LOS ASOCIADOS O SU REPRESENTANTE COMÚN. LAS PROPOSICIONES TÉCNICAS Y ECONÓMICAS DEBERÁN SER FIRMADAS POR EL REPRESENTANTE COMÚN QUE HAYA SIDO DESIGNADO POR EL GRUPO DE PERSONAS. EN EL ACTO DE PRESENTACIÓN Y APERTURA DE PROPOSICIONES EL REPRESENTANTE COMÚN DE LA AGRUPACIÓN DEBERÁ SEÑALAR QUE LA PROPOSICIÓN SE PRESENTA EN FORMA CONJUNTA. EL CONVENIO A QUE HACE REFERENCIA LA FRACCIÓN II DE ESTE ARTÍCULO SE PRESENTARÁ CON LA PROPOSICIÓN Y, EN CASO DE QUE A LOS LICITANTES QUE LA HUBIEREN PRESENTADO SE LES ADJUDIQUE EL CONTRATO, DICHO CONVENIO FORMARÁ PARTE DEL MISMO COMO UNO DE SUS ANEXOS. PARA ACREDITAR LA CAPACIDAD FINANCIERA REQUERIDA POR LA CONVOCANTE, SE PODRÁN CONSIDERAR EN CONJUNTO LAS CORRESPONDIENTES A CADA UNA DE LAS PERSONAS INTEGRANTES DE LA AGRUPACIÓN, TOMANDO EN CUENTA SI LA OBLIGACIÓN QUE ASUMIRÁN ES MANCOMUNADA O SOLIDARIA. EL NO INDICAR EN EL CONVENIO A QUE SE HA HECHO REFERENCIA, LAS PARTES QUE CADA ASOCIADO SE COMPROMETE A REALIZAR, SERÁ CAUSA DE DESECHAMIENTO DE LA PROPOSICIÓN CONJUNTA. EL CONVENIO PRIVADO REFERIDO DEBERÁ CONTENER DEBIDAMENTE IDENTIFICADOS A CADA UNO DE LOS INTEGRANTES DE LA PROPOSICIÓN CONJUNTA, SEÑALANDO EN EL CASO DE PERSONAS MORALES LA RAZÓN SOCIAL QUE CORRESPONDA A CADA UNA DE ELLAS DE ACUERDO CON SU REGISTRO FEDERAL DE CONTRIBUYENTES Y EN EL CASO DE PERSONAS FÍSICAS, EL NOMBRE DE ACUERDO CON SU DOCUMENTO DE INSCRIPCIÓN A DICHO REGISTRO; LA OMISIÓN DE ESTE REQUISITO, SERÁ MOTIVO DE DESECHAMIENTO DE LA PROPOSICIÓN. q) LA MANIFESTACIÓN ESCRITA BAJO PROTESTA DE DECIR VERDAD DE NO ENCONTRARSE EN LOS SUPUESTOS QUE ESTABLECEN LOS ARTÍCULOS 51 Y 78 PENÚLTIMO PÁRRAFO DE LA LEY Y QUE POR SU CONDUCTO NO PARTICIPAN EN LOS PROCEDIMIENTOS DE CONTRATACIÓN PERSONAS FÍSICAS O MORALES QUE SE ENCUENTREN INHABILITADAS POR RESOLUCIÓN DE LA SECRETARIA DE LA FUNCIÓN PÚBLICA,ANEXO 2, LAS PERSONAS A QUE SE REFIERE EL SEGUNDO PÁRRAFO DE LA FRACCIÓN VII DEL ARTÍCULO 51 DE LA LEY, DEBERÁN PRESENTAR ESCRITO DE MANIFESTACIÓN BAJO PROTESTA DE DECIR VERDAD EN LOS TÉRMINOS DEL ARTICULO 31 FRACCIÓN XV DE LA LEY. ESTO DEBERÁ SER PRESENTADO EN ESCRITOS DE MANERA INDIVIDUAL, POR CADA UNO DE LOS INTEGRANTES DE LA PROPOSICIÓN CONJUNTA. LA INSOLVENCIA O INCAPACIDAD PARA CONTRATAR, DE ALGUNO DE LOS PARTICIPANTES, AFECTARÁ DE SOLVENCIA DE LA TOTALIDAD DE LA PROPOSICIÓN CONJUNTA. ASIMISMO SE DEBERÁ PRESENTAR EN FORMA INDIVIDUAL LA MANIFESTACIÓN ESCRITA BAJO PROTESTA DE DECIR VERDAD DE LA DECLARACIÓN DE INTEGRIDAD, EN APEGO AL ANEXO 3. EL INSTITUTO NO FIRMARÁ EL CONTRATO DERIVADO DE LA PROPOSICIÓN CONJUNTA CORRESPONDIENTE, SI SE ELIMINA Ó SUSTITUYE ALGUNO DE LOS INTEGRANTES O SE VARÍA EL ALCANCE DE LA PROPOSICIÓN CONJUNTA ORIGINAL. PARA EFECTOS DE DAR CUMPLIMIENTO A LAS GARANTÍAS QUE SE ESTABLEZCAN EN ESTA CONVOCATORIA, SE DEBERÁ PRESENTAR UNA SOLA PÓLIZA DE FIANZA OTORGADA POR TODOS LOS INTEGRANTES, PARA CADA UNA DE LAS GARANTÍAS SOLICITADAS. r) EL LICITANTE DEBERÁ PRESENTAR UNA DECLARACIÓN DE INTEGRIDAD, EN ESTRICTO APEGO AL ANEXO 3 DE ESTA CONVOCATORIA, EN EL QUE MANIFIESTE QUE POR SÍ MISMO O A TRAVÉS DE INTERPÓSITA PERSONA, SE ABSTENDRÁ DE ADOPTAR CONDUCTAS, PARA QUE LOS SERVIDORES PÚBLICOS DE EL INSTITUTO, INDUZCAN O ALTEREN LAS EVALUACIONES DE LAS PROPOSICIONES, EL RESULTADO DEL PROCEDIMIENTO, U OTROS ASPECTOS QUE OTORGUEN CONDICIONES MÁS VENTAJOSAS CON RELACIÓN A LOS DEMÁS PARTICIPANTES. s) EL LICITANTE DEBERÁ PRESENTAR DENTRO DE SU PROPOSICIÓN TÉCNICA EL ANEXO 4 DEBIDAMENTE REQUISITADO, O BIEN UN ESCRITO PREFERENTEMENTE EN PAPEL CON MEMBRETE EN EL QUE MANIFIESTE BAJO PROTESTA DE DECIR VERDAD, QUE ES DE NACIONALIDAD MEXICANA. 9 9 t) NO SE PODRÁN PRESENTAR PROPOSICIONES A TRAVÉS DE MEDIOS REMOTOS DE COMUNICACIÓN ELECTRÓNICA, YA QUE EL INSTITUTO NO CUENTA CON LA INFRAESTRUCTURA QUE SE REQUIERE PARA LA CERTIFICACIÓN POR PARTE DE LA SFP. u) EL LICITANTE DEBERÁ PRESENTAR ADEMÁS DENTRO DE SU PROPOSICIÓN UN DISCO COMPACTO O USB CONTENIENDO EL DOCUMENTO REFERENTE A CÉDULA DE PAGOS Y PROGRAMA DE EROGACIONES EN FORMATO EXCEL, ANEXO 17, NO SERÁ MOTIVO DE DESECHAMIENTO DE LA PROPOSICIÓN EL INCUMPLIMIENTO DE DICHO REQUISITO. v) EL LICITANTE DEBERÁ PRESENTAR EL FORMATO PARA LA VERIFICACIÓN DE LA RECEPCIÓN DE DOCUMENTOS, ANEXO 20, A EFECTO DE FACILITAR Y AGILIZAR LA PRESENTACIÓN DE LAS PROPOSICIONES, ASÍ COMO DEJAR CONSTANCIA DEL CUMPLIMIENTO DE LOS REQUISITOS SOLICITADOS EN LA PRESENTE CONVOCATORIA, ESTO DE ACUERDO A LOS ARTÍCULOS 34 FRACCIÓN IX Y 61 FRACCIÓN I DEL REGLAMENTO. 7. RELACIÓN DE LA DOCUMENTACIÓN QUE DEBERÁ INTEGRAR EL LICITANTE 7.1 DOCUMENTACIÓN LEGAL Y ADMINISTRATIVA. ESTA DOCUMENTACIÓN PODRÁ ENTREGARSE DENTRO O FUERA DEL SOBRE A ELECCIÓN DEL LICITANTE, CONFORME A LO ESTABLECIDO EN EL ARTÍCULO 36 DE LOPSRM Y 61 DE SU REGLAMENTO. 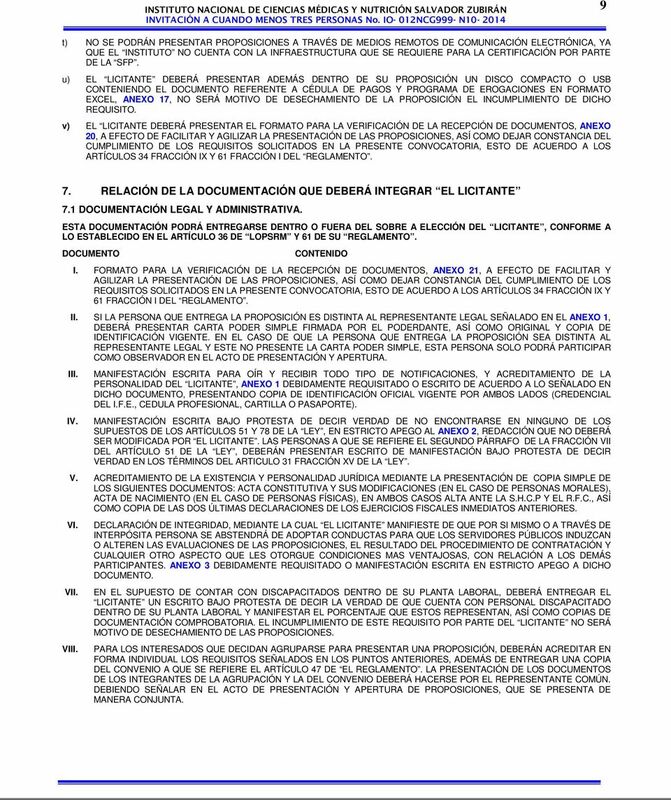 DOCUMENTO CONTENIDO I. FORMATO PARA LA VERIFICACIÓN DE LA RECEPCIÓN DE DOCUMENTOS, ANEXO 21, A EFECTO DE FACILITAR Y AGILIZAR LA PRESENTACIÓN DE LAS PROPOSICIONES, ASÍ COMO DEJAR CONSTANCIA DEL CUMPLIMIENTO DE LOS REQUISITOS SOLICITADOS EN LA PRESENTE CONVOCATORIA, ESTO DE ACUERDO A LOS ARTÍCULOS 34 FRACCIÓN IX Y 61 FRACCIÓN I DEL REGLAMENTO. II. SI LA PERSONA QUE ENTREGA LA PROPOSICIÓN ES DISTINTA AL REPRESENTANTE LEGAL SEÑALADO EN EL ANEXO 1, DEBERÁ PRESENTAR CARTA PODER SIMPLE FIRMADA POR EL PODERDANTE, ASÍ COMO ORIGINAL Y COPIA DE IDENTIFICACIÓN VIGENTE. EN EL CASO DE QUE LA PERSONA QUE ENTREGA LA PROPOSICIÓN SEA DISTINTA AL REPRESENTANTE LEGAL Y ESTE NO PRESENTE LA CARTA PODER SIMPLE, ESTA PERSONA SOLO PODRÁ PARTICIPAR COMO OBSERVADOR EN EL ACTO DE PRESENTACIÓN Y APERTURA. III. IV. MANIFESTACIÓN ESCRITA PARA OÍR Y RECIBIR TODO TIPO DE NOTIFICACIONES, Y ACREDITAMIENTO DE LA PERSONALIDAD DEL LICITANTE, ANEXO 1 DEBIDAMENTE REQUISITADO O ESCRITO DE ACUERDO A LO SEÑALADO EN DICHO DOCUMENTO, PRESENTANDO COPIA DE IDENTIFICACIÓN OFICIAL VIGENTE POR AMBOS LADOS (CREDENCIAL DEL I.F.E., CEDULA PROFESIONAL, CARTILLA O PASAPORTE). MANIFESTACIÓN ESCRITA BAJO PROTESTA DE DECIR VERDAD DE NO ENCONTRARSE EN NINGUNO DE LOS SUPUESTOS DE LOS ARTÍCULOS 51 Y 78 DE LA LEY, EN ESTRICTO APEGO AL ANEXO 2, REDACCIÓN QUE NO DEBERÁ SER MODIFICADA POR EL LICITANTE. LAS PERSONAS A QUE SE REFIERE EL SEGUNDO PÁRRAFO DE LA FRACCIÓN VII DEL ARTÍCULO 51 DE LA LEY, DEBERÁN PRESENTAR ESCRITO DE MANIFESTACIÓN BAJO PROTESTA DE DECIR VERDAD EN LOS TÉRMINOS DEL ARTICULO 31 FRACCIÓN XV DE LA LEY. V. ACREDITAMIENTO DE LA EXISTENCIA Y PERSONALIDAD JURÍDICA MEDIANTE LA PRESENTACIÓN DE COPIA SIMPLE DE LOS SIGUIENTES DOCUMENTOS: ACTA CONSTITUTIVA Y SUS MODIFICACIONES (EN EL CASO DE PERSONAS MORALES), ACTA DE NACIMIENTO (EN EL CASO DE PERSONAS FÍSICAS), EN AMBOS CASOS ALTA ANTE LA S.H.C.P Y EL R.F.C., ASÍ COMO COPIA DE LAS DOS ÚLTIMAS DECLARACIONES DE LOS EJERCICIOS FISCALES INMEDIATOS ANTERIORES. VI. VII. VIII. DECLARACIÓN DE INTEGRIDAD, MEDIANTE LA CUAL EL LICITANTE MANIFIESTE DE QUE POR SI MISMO O A TRAVÉS DE INTERPÓSITA PERSONA SE ABSTENDRÁ DE ADOPTAR CONDUCTAS PARA QUE LOS SERVIDORES PÚBLICOS INDUZCAN O ALTEREN LAS EVALUACIONES DE LAS PROPOSICIONES, EL RESULTADO DEL PROCEDIMIENTO DE CONTRATACIÓN Y CUALQUIER OTRO ASPECTO QUE LES OTORGUE CONDICIONES MAS VENTAJOSAS, CON RELACIÓN A LOS DEMÁS PARTICIPANTES. ANEXO 3 DEBIDAMENTE REQUISITADO O MANIFESTACIÓN ESCRITA EN ESTRICTO APEGO A DICHO DOCUMENTO. EN EL SUPUESTO DE CONTAR CON DISCAPACITADOS DENTRO DE SU PLANTA LABORAL, DEBERÁ ENTREGAR EL LICITANTE UN ESCRITO BAJO PROTESTA DE DECIR LA VERDAD DE QUE CUENTA CON PERSONAL DISCAPACITADO DENTRO DE SU PLANTA LABORAL Y MANIFESTAR EL PORCENTAJE QUE ESTOS REPRESENTAN, ASÍ COMO COPIAS DE DOCUMENTACIÓN COMPROBATORIA. EL INCUMPLIMIENTO DE ESTE REQUISITO POR PARTE DEL LICITANTE NO SERÁ MOTIVO DE DESECHAMIENTO DE LAS PROPOSICIONES. 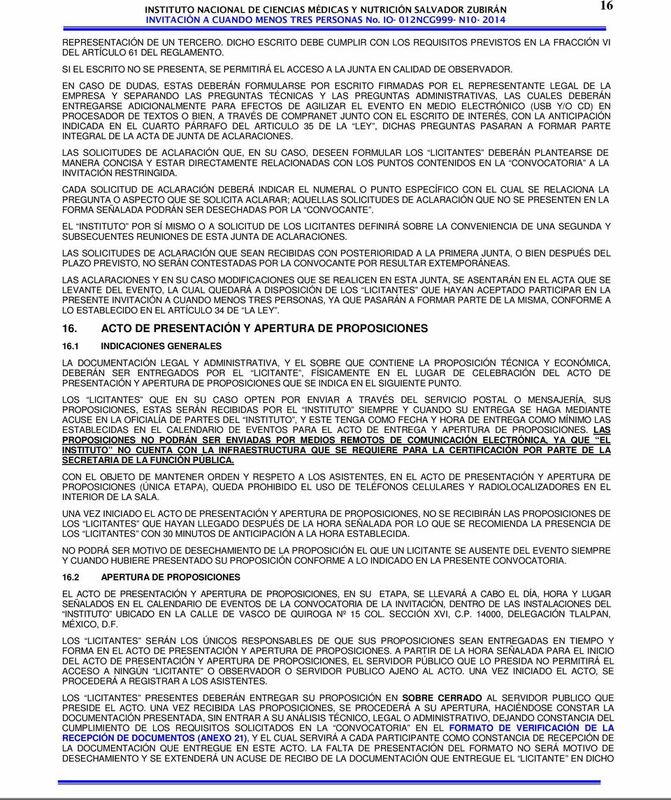 PARA LOS INTERESADOS QUE DECIDAN AGRUPARSE PARA PRESENTAR UNA PROPOSICIÓN, DEBERÁN ACREDITAR EN FORMA INDIVIDUAL LOS REQUISITOS SEÑALADOS EN LOS PUNTOS ANTERIORES, ADEMÁS DE ENTREGAR UNA COPIA DEL CONVENIO A QUE SE REFIERE EL ARTÍCULO 47 DE EL REGLAMENTO. LA PRESENTACIÓN DE LOS DOCUMENTOS DE LOS INTEGRANTES DE LA AGRUPACIÓN Y LA DEL CONVENIO DEBERÁ HACERSE POR EL REPRESENTANTE COMÚN. DEBIENDO SEÑALAR EN EL ACTO DE PRESENTACIÓN Y APERTURA DE PROPOSICIONES, QUE SE PRESENTA DE MANERA CONJUNTA. 10 10 PREVIAMENTE A LA FIRMA DEL CONTRATO, EL LICITANTE GANADOR DEBERÁ PRESENTAR PARA SU COTEJO, ORIGINAL O COPIA CERTIFICADA DE LOS DOCUMENTOS CON LOS QUE SE ACREDITE SU EXISTENCIA LEGAL Y LAS FACULTADES DE SU REPRESENTANTE PARA SUSCRIBIR EL CONTRATO CORRESPONDIENTE. EN CASO DE AGRUPACIÓN DEBERÁ SER DE CADA UNO DE LOS ASOCIADOS. 7.2 DOCUMENTACIÓN TÉCNICA Y ECONÓMICA DOCUMENTO CONTENIDO T-1 MANIFESTACIÓN ESCRITA DE CONOCER EL SITIO DE REALIZACIÓN DE LOS TRABAJOS Y SUS CONDICIONES AMBIENTALES; ESTAR CONFORME EN AJUSTARSE A LAS LEYES Y REGLAMENTOS APLICABLES, A LOS TÉRMINOS DE LA CONVOCATORIA DE LA INVITACIÓN RESTRINGIDA, SUS ANEXOS Y LAS MODIFICACIONES QUE, EN SU CASO, SE HAYAN EFECTUADO; AL MODELO DEL CONTRATO, EL ANTEPROYECTO ARQUITECTÓNICO; EL HABER CONOCER LAS NORMAS DE CALIDAD DE LOS MATERIALES Y LAS ESPECIFICACIONES GENERALES Y PARTICULARES DE CONSTRUCCIÓN DE LA SECRETARÍA DE SALUD, Y DEL INSTITUTO MEXICANO DEL SEGURO SOCIAL, DE CONFORMIDAD CON LO ESTABLECIDO EN EL ARTÍCULO 44 FRACCIÓN I DEL REGLAMENTO. 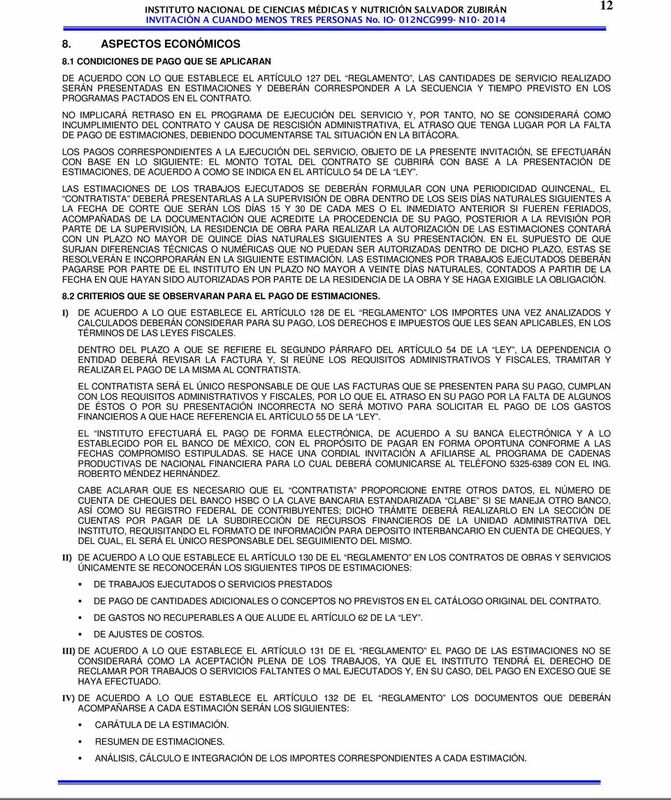 T-2 MANIFESTACIÓN DE NACIONALIDAD MEXICANA, ANEXO 4 DEBIDAMENTE REQUISITADO O UN ESCRITO PREFERENTEMENTE EN PAPEL CON MEMBRETE EN ESTRICTO APEGO A DICHO DOCUMENTO. T-3 MANIFESTACIÓN ESCRITA DE HABER Ó NO HABER, ASISTIDO A LA JUNTA(S) DE ACLARACIONES Y COPIA DE LA MINUTA DE LA JUNTA DE ACLARACIONES. ASÍ COMO CONSTANCIA DE VISITA AL SITIO EN DONDE SE EJECUTARÁN LOS TRABAJOS ANEXO 5, O MANIFESTACIÓN ESCRITA DE NO HABER ASISTIDO PERO QUE CONOCEN EL SITIO DONDE SE REALIZARÁN LOS TRABAJOS. T-4 EL LICITANTE DEBERÁ ENTREGAR TRES DOCUMENTOS; UNO EN QUE DESCRIBA LA METODOLOGÍA QUE EMPLEARÁ PARA DESARROLLAR EL SERVICIO MOTIVO DE ESTA LICITACIÓN, EL SEGUNDO SERÁ EL PLAN DE TRABAJO QUE SE UTILIZARÁ PARA LA PRESTACIÓN DEL SERVICIOS, Y EL TERCERO CONSISTIRÁ EN EL ESQUEMA ESTRUCTURAL DE LA ORGANIZACIÓN, DONDE DEMOSTRARÁ QUE TIENE LA ORGANIZACIÓN ADECUADA PARA CUMPLIR CON EL OBJETIVO DE LA PRESENTE CONVOCATORIA., DE CONFORMIDAD CON LO ESTIPULADO EN EL ARTÍCULO 44 FRACCIÓN II, DEL REGLAMENTO T-5 CURRÍCULUM DE CADA UNO DE LOS PROFESIONALES TÉCNICOS QUE SERÁN RESPONSABLES DE LA DIRECCIÓN, ADMINISTRACIÓN Y EJECUCIÓN DEL SERVICIO, SOLICITADOS COMO MÍNIMO PARA ESTE PROCESO DE CONTRATACIÓN, LOS QUE DEBERÁN TENER EXPERIENCIA EN OBRAS CON CARACTERÍSTICAS TÉCNICAS Y MAGNITUD SIMILARES, ANEXANDO ORGANIGRAMA CON NOMBRES Y CARGO DEL PERSONAL QUE SERÁ RESPONSABLE DE LA EJECUCIÓN DEL SERVICIO, DE CONFORMIDAD CON LO ESTIPULADO EN EL ARTÍCULO 44 FRACCIÓN III, DEL REGLAMENTO. T-6 ACREDITAMIENTO DE LA CAPACIDAD TÉCNICA, PRESENTANDO CURRICULUM DE LA EMPRESA DONDE SE DEMUESTRE Y ACREDITE LA EXPERIENCIA TÉCNICA SOLICITADA PARA ESTE PROCEDIMIENTO DE CONTRATACIÓN, PRESENTANDO UNA RELACIÓN DE LOS CONTRATOS CELEBRADOS CON LA ADMINISTRACIÓN PÚBLICA Y PRIVADA, DONDE SE SEÑALEN IMPORTES TOTALES, IMPORTES EJERCIDOS O POR EJERCER, VIGENCIA, PORCENTAJE DE AVANCE, DICHA RELACIÓN CONTENDRÁ NOMBRE DEL CONTRATANTE, DIRECCIÓN Y TELÉFONO DONDE SE PUEDA CORROBORAR LA INFORMACIÓN. ANEXANDO COPIAS DE LOS CONTRATOS Y SUS RESPECTIVAS ACTAS DE ENTREGA RECEPCIÓN DE TRABAJOS QUE SEAN SIMILARES EN COMPLEJIDAD, MAGNITUD Y MONTO A LOS DE ESTA INVITACIÓN DE LOS ÚLTIMOS CINCO AÑOS. T-7 ACREDITACIÓN DE LA CAPACIDAD FINANCIERA PRESENTANDO COPIA DE SUS DECLARACIONES ANUALES FISCALES DE LOS DOS ÚLTIMOS EJERCICIOS, Y ESTADOS FINANCIEROS CON EL COMPARATIVO DE RAZONES FINANCIERAS BÁSICAS DE AMBOS EJERCICIOS, ASÍ COMO UN ESTADO FINANCIERO CON UNA ANTIGÜEDAD NO MAYOR A TRES MESES, FIRMADOS POR CONTADOR EXTERNO ANEXANDO COPIA DE SU CÉDULA PROFESIONAL, MEDIANTE EL CUAL DEBERÁN COMPROBAR EL CAPITAL NETO DE TRABAJO MÍNIMO SOLICITADO PARA ESTA CONVOCATORIA. EN CASO DE QUE TENGA LA OBLIGACIÓN DE DICTAMINAR SUS ESTADOS FINANCIEROS, ESTOS DEBERÁN SER FIRMADOS POR UN CONTADOR PÚBLICO REGISTRADO Y FACULTADO PARA ESTOS EFECTOS, ANEXÁNDOSE COPIA DEL REGISTRO VIGENTE ANTE LA SECRETARÍA DE HACIENDA Y CRÉDITO PÚBLICO Y CÉDULA PROFESIONAL DEL SIGNATARIO. T-8 RELACIÓN DE EQUIPO E INSTRUMENTOS CIENTÍFICOS, INDICANDO SI SON DE SU PROPIEDAD, ARRENDADAS CON O SIN OPCIÓN A COMPRA, SU UBICACIÓN FÍSICA, MODELOS Y USOS ACTUALES, ASÍ COMO LA FECHA EN QUE SE DISPONDRÁ DE ESTOS INSUMOS EN EL SITIO DE LOS TRABAJOS, COMO SE MENCIONA EN EL ARTÍCULO 44 FRACCIÓN VII DEL REGLAMENTO. ANEXO 6. T-9 MODELO DE CONTRATO, ANEXANDO IMPRESIÓN Y RUBRICÁNDOLO EN TODAS SUS HOJAS. ANEXO 7. T-10 DEVOLVER LAS ESPECIFICACIONES Y TÉRMINOS DE REFERENCIA, ENTREGADAS COMO ANEXO 8 FIRMADAS, ASÍ COMO EN SU CASO PLANOS, MEMORIAS TÉCNICAS Y DEMÁS INFORMACIÓN PROPORCIONADA PARA LA ELABORACIÓN DE SU PROPOSICIÓN, DE CONOCIMIENTO Y ACEPTACIÓN DE LAS MISMAS. 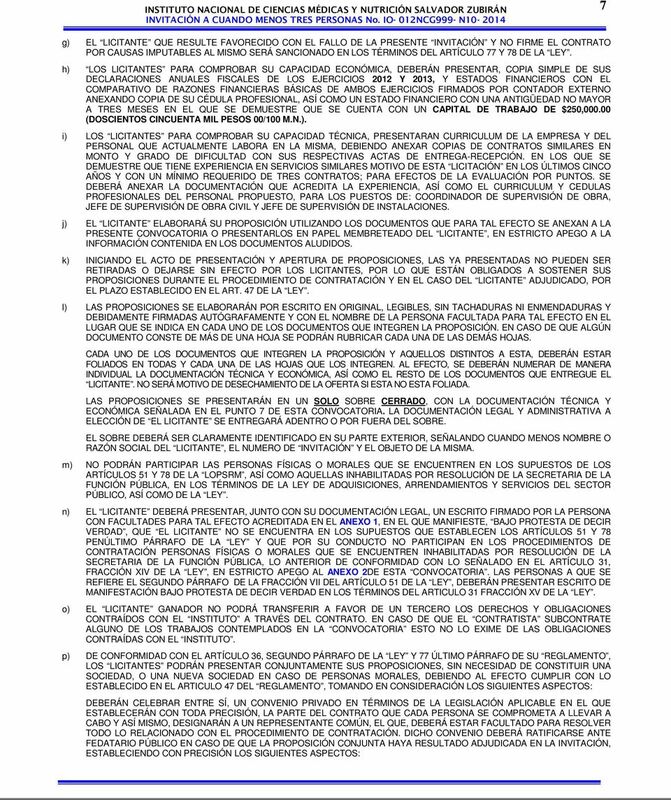 E-1 CARTA COMPROMISO DE LA PROPOSICIÓN EN PAPEL MEMBRETEADO DEL LICITANTE, RESPETANDO EL TEXTO PRESENTADO EN EL ANEXO 9. E-2 ANÁLISIS DE TODOS LOS PRECIOS UNITARIOS, ESTRUCTURADOS EN COSTOS DIRECTOS, INDIRECTOS, DE FINANCIAMIENTO Y DE UTILIDAD ASÍ COMO LO CARGOS ADICIONALES A QUE POR LEY ESTE OBLIGADO DE CONFORMIDAD CON LO ESTABLECIDOEN CAPÍTULO SEXTO, ARTÍCULOS DEL 185 AL 220 DEL REGLAMENTO. ANEXO 10. 11 11 E-3 RELACIÓN DE INSUMOS QUE INTERVIENEN EN LA INTEGRACIÓN DE LA PROPOSICIÓN, DEBERÁ CONTENER EL TOTAL DE LOS INSUMOS QUE INTERVENGAN EN EL PRESUPUESTO, ASÍ COMO SU UNIDAD DE MEDICIÓN, LA CANTIDAD, EL COSTO E IMPORTE DE CADA UNO DE ELLOS, Y EL RESUMEN CORRESPONDIENTE CLASIFICADO DE ACUERDO A: MATERIALES Y EQUIPOS DE INSTALACIÓN PERMANENTE, MANO DE OBRA, EQUIPO DE CONSTRUCCIÓN Y HERRAMIENTA. DE CONFORMIDAD CON LO SOLICITADO EN LOS ARTÍCULO 45 FRACCIÓN II DEL REGLAMENTO. E-4 ANÁLISIS, CÁLCULO E INTEGRACIÓN DEL FACTOR DE SALARIO REAL DEL PERSONAL TÉCNICO, ADMINISTRATIVO Y DE SERVICIOS QUE DESARROLLARÁ EL SERVICIO, COMO SE SOLICITA EN LOS ARTÍCULOS 191 Y 192 DEL REGLAMENTO, ANEXANDO EL TABULADOR ANEXO 11 DE SALARIOS BASE DE MANO DE OBRA POR JORNADA DIURNA DE OCHO HORAS E INTEGRACIÓN DE LOS SALARIOS. 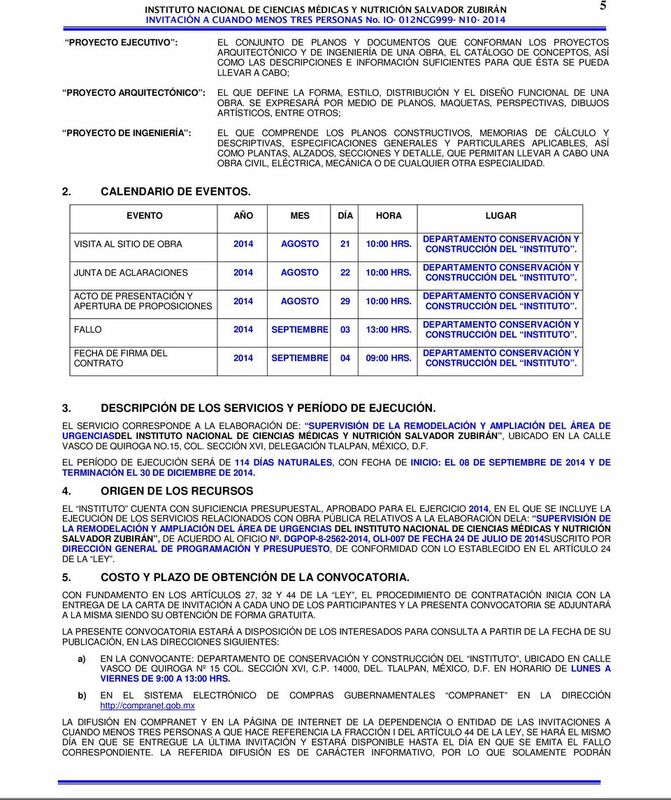 E-5 ANÁLISIS, CÁLCULO E INTEGRACIÓN DE LOS COSTOS HORARIOS DEL EQUIPO E INSTRUMENTO CIENTÍFICO, QUE EMPLEARÁ PARA LA EJECUCIÓN DEL SERVICIO, PUESTOS EN EL SITIO DE LA OBRA ACORDES AL SERVICIO A EJECUTAR, DEBIENDO CONSIDERAR ESTOS, PARA EFECTOS DE EVALUACIÓN, COSTOS Y RENDIMIENTOS DE EQUIPO E INSTRUMENTOS NUEVOS, DE ACUERDO A LO SEÑALADO EN LOS ARTÍCULOS 45 FRACCIÓN IV, Y DEL 194 AL 210 DEL REGLAMENTO. ANEXO 12. E-6 ANÁLISIS, CÁLCULO E INTEGRACIÓN DE LOS COSTOS INDIRECTOS. SE PRESENTARÁ EL ANÁLISIS PARA SU DETERMINACIÓN, DESGLOSÁNDOSE LOS CONCEPTOS CORRESPONDIENTES A LA ADMINISTRACIÓN DE OFICINAS DE CAMPO Y LOS DE OFICINA CENTRALES, DEBIÉNDOSE ESTRUCTURAR COMO LO ESTABLECEN LOS ARTÍCULOS 45 APARTADO A, FRACCIÓN V, 211, 212 Y 213 DEL REGLAMENTO. ANEXO 13. E-7 ANÁLISIS, CÁLCULO E INTEGRACIÓN DEL COSTO DE FINANCIAMIENTO. EL COSTO DEL FINANCIAMIENTO DEL SERVICIO DEBERÁ CALCULARSE COMO UN PORCENTAJE DE LA SUMA DE LOS COSTOS DIRECTOS E INDIRECTOS Y CORRESPONDERÁ A LOS GASTOS DERIVADOS POR LA INVERSIÓN DE RECURSOS PROPIOS O CONTRATADOS, QUE REALICE EL CONTRATISTA PARA DAR CUMPLIMIENTO AL PROGRAMA DE EJECUCIÓN DEL SERVICIO. PARA ESTRUCTURAR EL COSTO DE FINANCIAMIENTO LOS LICITANTES DEBERÁN BASARSE A LO QUE ESTABLECEN LOS ARTÍCULOS 50 FRACCIÓN III DE LA LEY, 45 APARTADO A, FRACCIÓN VI, Y DEL 214 AL 218 DEL REGLAMENTO. ANEXO 14. 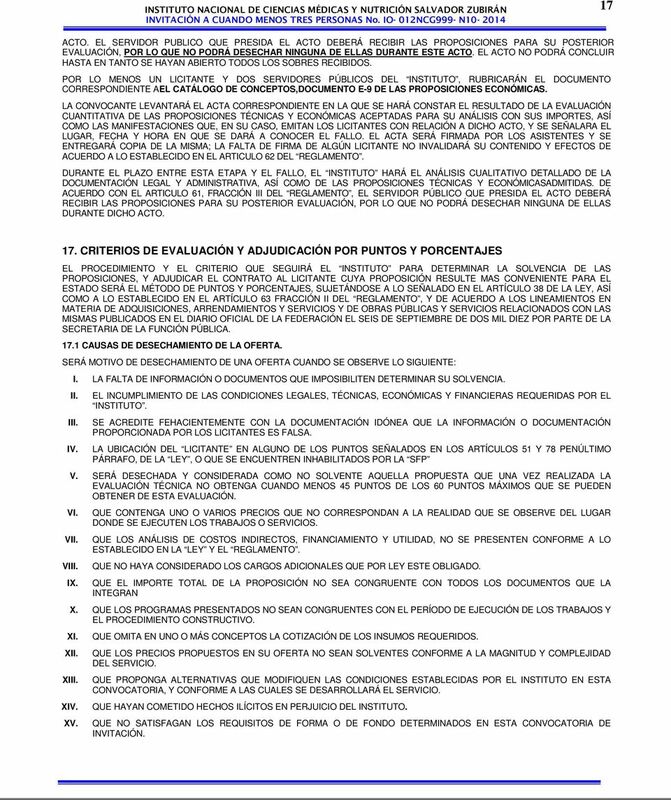 E-8 ESCRITO EN PAPEL MEMBRETEADO DONDE SE MANIFIESTE LA UTILIDAD PROPUESTA UTILIZADA POR EL LICITANTE, DE CONFORMIDAD CON LO SOLICITADO EN LOS ARTÍCULOS 45 APARTADO A, FRACCIÓN VII Y 219 DEL REGLAMENTO,ANEXO 15. 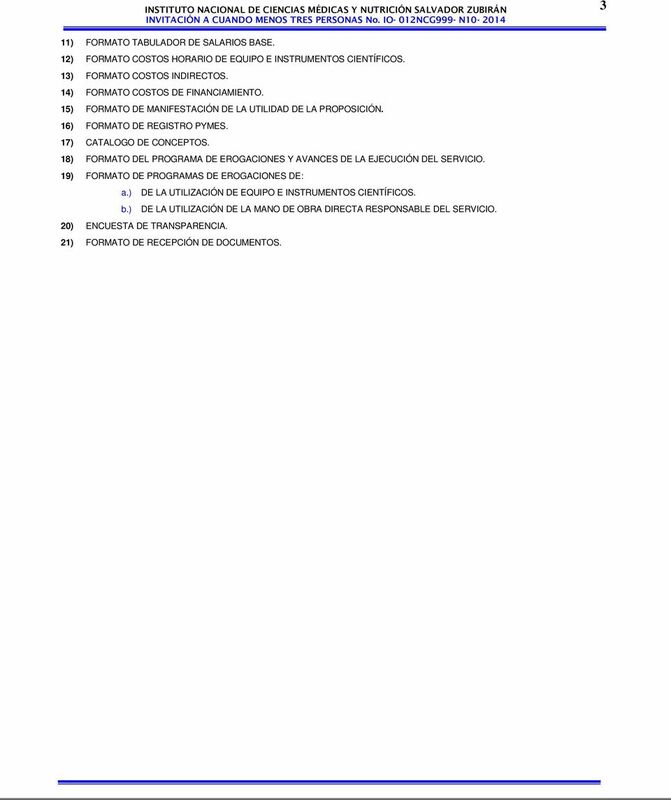 E-9 UN ESCRITO DONDE SE RELACIONEN LAS EMPRESAS MIPYMES QUE SE SUBCONTRATARAN PARA LA EJECUCIÓN DEL SERVICIO ASÍ COMO EL ESCRITO DONDE SE SEÑALE LA CATEGORÍA DE LA EMPRESA CONFORME AL ANEXO 16. 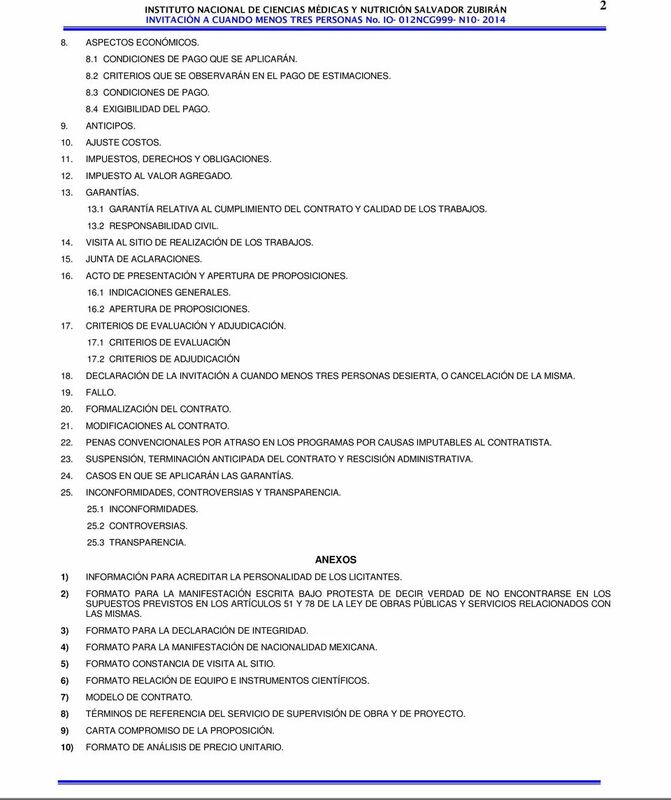 E-10 CATÁLOGO DE CONCEPTOS, CONTENIENDO DESCRIPCIÓN, UNIDADES DE MEDICIÓN, CANTIDADES DE TRABAJO, PRECIOS UNITARIOS CON NÚMERO Y LETRA E IMPORTES POR CONCEPTO, SUBPARTIDA, PARTIDA Y DEL TOTAL DE LA PROPOSICIÓN. ESTE DOCUMENTO FORMARÁ EL PRESUPUESTO QUE SERVIRÁ PARA FORMALIZAR EL CONTRATO CORRESPONDIENTE, LO ANTERIOR DE CONFORMIDAD CON LO SOLICITADO EN EL ARTÍCULO 45, FRACCIÓN IX, DEL REGLAMENTO. ANEXO 17. ASÍ COMO TAMBIÉN SE RECOMIENDA ANEXAR UN DISCO COMPACTO O USB CONTENIENDO LA INFORMACIÓN DE DICHO DOCUMENTO, EN PROGRAMA EXCEL. E-11 PROGRAMA DE EJECUCIÓN GENERAL DEL SERVICIO CONFORME AL CATALOGO DE CONCEPTOS CON MONTOS, CALENDARIZADO Y CUANTIFICADO CONFORME A LOS PERÍODOS DETERMINADOS POR EL INSTITUTO, DIVIDIDO EN PARTIDAS Y SUBPARTIDAS, DEL TOTAL DE LOS CONCEPTOS DE TRABAJO, UTILIZANDO PREFERENTEMENTE DIAGRAMAS DE BARRAS, COMO SE ESTABLECE EN EL ARTÍCULO 254 APARTADO A, FRACCIÓN IV DEL REGLAMENTO. a) DE LA EJECUCIÓN GENERAL DEL SERVICIO CON MONTOS Y PORCENTAJES DE AVANCE MENSUALES. ANEXO 18. E-12 PROGRAMA DE EROGACIONES CALENDARIZADOS Y CUANTIFICADOS EN PARTIDAS O ACTIVIDADES DE LA UTILIZACIÓN MENSUAL UTILIZANDO PREFERENTEMENTE DIAGRAMAS DE BARRAS, COMO SE ESTABLECE EN EL ARTÍCULO 254, APARTADO B FRACCIÓN VI DEL REGLAMENTO DE LOS SIGUIENTES RUBROS: a) DE LA MAQUINARÍA Y EQUIPO REQUERIDO, INCLUYENDO EL CIENTÍFICO, DE COMPUTO, DE MEDICIÓN Y EN GENERAL QUE SE REQUIERAN PARA LA DEL SERVICIO CON MONTOS MENSUALES. ANEXO 19a. b) DE LA UTILIZACIÓN DE LA MANO DE OBRA DIRECTA RESPONSABLE DE LA PRESTACIÓN DEL SERVICIO A COSTO DIRECTO CON MONTOS CALENDARIZADO EN PERÍODOS MENSUALES. ANEXO 19b. LOS DOCUMENTOS QUE FORMAN LA DOCUMENTACIÓN TÉCNICA Y ECONÓMICA DEBERÁN PRESENTARSE EN PAPEL MEMBRETEADO DE LA EMPRESA Y FIRMADOS POR PERSONA LEGALMENTE ACREDITADA, EN EL ORDEN QUE SE INDICA.SE RECOMIENDA QUE ESTÉN DEBIDAMENTE FOLIADOS, SEPARADOS POR UNA HOJA QUE INDIQUE EL DOCUMENTO QUE CONTIENE, ASÍ COMO HACER REFERENCIA AL NUMERO DE PROCEDIMIENTO DE CONTRATACIÓN EN EL QUE PARTICIPAN, PREFERENTEMENTE NO DEBERÁN ESTAR ENGRAPADOS NI ENGARGOLADOS PARA FACILITAR EL LIBRE MANIPULEO DE LOS DOCUMENTOS DURANTE LA APERTURA, LO ANTERIOR NO SERÁ MOTIVO DE DESECHAMIENTO DE LA PROPOSICIÓN. 12 12 8. ASPECTOS ECONÓMICOS 8.1 CONDICIONES DE PAGO QUE SE APLICARAN DE ACUERDO CON LO QUE ESTABLECE EL ARTÍCULO 127 DEL REGLAMENTO, LAS CANTIDADES DE SERVICIO REALIZADO SERÁN PRESENTADAS EN ESTIMACIONES Y DEBERÁN CORRESPONDER A LA SECUENCIA Y TIEMPO PREVISTO EN LOS PROGRAMAS PACTADOS EN EL CONTRATO. NO IMPLICARÁ RETRASO EN EL PROGRAMA DE EJECUCIÓN DEL SERVICIO Y, POR TANTO, NO SE CONSIDERARÁ COMO INCUMPLIMIENTO DEL CONTRATO Y CAUSA DE RESCISIÓN ADMINISTRATIVA, EL ATRASO QUE TENGA LUGAR POR LA FALTA DE PAGO DE ESTIMACIONES, DEBIENDO DOCUMENTARSE TAL SITUACIÓN EN LA BITÁCORA. LOS PAGOS CORRESPONDIENTES A LA EJECUCIÓN DEL SERVICIO, OBJETO DE LA PRESENTE INVITACIÓN, SE EFECTUARÁN CON BASE EN LO SIGUIENTE: EL MONTO TOTAL DEL CONTRATO SE CUBRIRÁ CON BASE A LA PRESENTACIÓN DE ESTIMACIONES, DE ACUERDO A COMO SE INDICA EN EL ARTÍCULO 54 DE LA LEY. LAS ESTIMACIONES DE LOS TRABAJOS EJECUTADOS SE DEBERÁN FORMULAR CON UNA PERIODICIDAD QUINCENAL, EL CONTRATISTA DEBERÁ PRESENTARLAS A LA SUPERVISIÓN DE OBRA DENTRO DE LOS SEIS DÍAS NATURALES SIGUIENTES A LA FECHA DE CORTE QUE SERÁN LOS DÍAS 15 Y 30 DE CADA MES O EL INMEDIATO ANTERIOR SI FUEREN FERIADOS, ACOMPAÑADAS DE LA DOCUMENTACIÓN QUE ACREDITE LA PROCEDENCIA DE SU PAGO, POSTERIOR A LA REVISIÓN POR PARTE DE LA SUPERVISIÓN, LA RESIDENCIA DE OBRA PARA REALIZAR LA AUTORIZACIÓN DE LAS ESTIMACIONES CONTARÁ CON UN PLAZO NO MAYOR DE QUINCE DÍAS NATURALES SIGUIENTES A SU PRESENTACIÓN. EN EL SUPUESTO DE QUE SURJAN DIFERENCIAS TÉCNICAS O NUMÉRICAS QUE NO PUEDAN SER AUTORIZADAS DENTRO DE DICHO PLAZO, ESTAS SE RESOLVERÁN E INCORPORARÁN EN LA SIGUIENTE ESTIMACIÓN. LAS ESTIMACIONES POR TRABAJOS EJECUTADOS DEBERÁN PAGARSE POR PARTE DE EL INSTITUTO EN UN PLAZO NO MAYOR A VEINTE DÍAS NATURALES, CONTADOS A PARTIR DE LA FECHA EN QUE HAYAN SIDO AUTORIZADAS POR PARTE DE LA RESIDENCIA DE LA OBRA Y SE HAGA EXIGIBLE LA OBLIGACIÓN. 8.2 CRITERIOS QUE SE OBSERVARAN PARA EL PAGO DE ESTIMACIONES. I) DE ACUERDO A LO QUE ESTABLECE EL ARTÍCULO 128 DE EL REGLAMENTO LOS IMPORTES UNA VEZ ANALIZADOS Y CALCULADOS DEBERÁN CONSIDERAR PARA SU PAGO, LOS DERECHOS E IMPUESTOS QUE LES SEAN APLICABLES, EN LOS TÉRMINOS DE LAS LEYES FISCALES. DENTRO DEL PLAZO A QUE SE REFIERE EL SEGUNDO PÁRRAFO DEL ARTÍCULO 54 DE LA LEY, LA DEPENDENCIA O ENTIDAD DEBERÁ REVISAR LA FACTURA Y, SI REÚNE LOS REQUISITOS ADMINISTRATIVOS Y FISCALES, TRAMITAR Y REALIZAR EL PAGO DE LA MISMA AL CONTRATISTA. EL CONTRATISTA SERÁ EL ÚNICO RESPONSABLE DE QUE LAS FACTURAS QUE SE PRESENTEN PARA SU PAGO, CUMPLAN CON LOS REQUISITOS ADMINISTRATIVOS Y FISCALES, POR LO QUE EL ATRASO EN SU PAGO POR LA FALTA DE ALGUNOS DE ÉSTOS O POR SU PRESENTACIÓN INCORRECTA NO SERÁ MOTIVO PARA SOLICITAR EL PAGO DE LOS GASTOS FINANCIEROS A QUE HACE REFERENCIA EL ARTÍCULO 55 DE LA LEY. EL INSTITUTO EFECTUARÁ EL PAGO DE FORMA ELECTRÓNICA, DE ACUERDO A SU BANCA ELECTRÓNICA Y A LO ESTABLECIDO POR EL BANCO DE MÉXICO, CON EL PROPÓSITO DE PAGAR EN FORMA OPORTUNA CONFORME A LAS FECHAS COMPROMISO ESTIPULADAS. SE HACE UNA CORDIAL INVITACIÓN A AFILIARSE AL PROGRAMA DE CADENAS PRODUCTIVAS DE NACIONAL FINANCIERA PARA LO CUAL DEBERÁ COMUNICARSE AL TELÉFONO CON EL ING. ROBERTO MÉNDEZ HERNÁNDEZ. CABE ACLARAR QUE ES NECESARIO QUE EL CONTRATISTA PROPORCIONE ENTRE OTROS DATOS, EL NÚMERO DE CUENTA DE CHEQUES DEL BANCO HSBC O LA CLAVE BANCARIA ESTANDARIZADA CLABE SI SE MANEJA OTRO BANCO, ASÍ COMO SU REGISTRO FEDERAL DE CONTRIBUYENTES; DICHO TRÁMITE DEBERÁ REALIZARLO EN LA SECCIÓN DE CUENTAS POR PAGAR DE LA SUBDIRECCIÓN DE RECURSOS FINANCIEROS DE LA UNIDAD ADMINISTRATIVA DEL INSTITUTO, REQUISITANDO EL FORMATO DE INFORMACIÓN PARA DEPOSITO INTERBANCARIO EN CUENTA DE CHEQUES, Y DEL CUAL, EL SERÁ EL ÚNICO RESPONSABLE DEL SEGUIMIENTO DEL MISMO. II) DE ACUERDO A LO QUE ESTABLECE EL ARTÍCULO 130 DE EL REGLAMENTO EN LOS CONTRATOS DE OBRAS Y SERVICIOS ÚNICAMENTE SE RECONOCERÁN LOS SIGUIENTES TIPOS DE ESTIMACIONES: DE TRABAJOS EJECUTADOS O SERVICIOS PRESTADOS DE PAGO DE CANTIDADES ADICIONALES O CONCEPTOS NO PREVISTOS EN EL CATÁLOGO ORIGINAL DEL CONTRATO. DE GASTOS NO RECUPERABLES A QUE ALUDE EL ARTÍCULO 62 DE LA LEY. DE AJUSTES DE COSTOS. III) DE ACUERDO A LO QUE ESTABLECE EL ARTÍCULO 131 DE EL REGLAMENTO EL PAGO DE LAS ESTIMACIONES NO SE CONSIDERARÁ COMO LA ACEPTACIÓN PLENA DE LOS TRABAJOS, YA QUE EL INSTITUTO TENDRÁ EL DERECHO DE RECLAMAR POR TRABAJOS O SERVICIOS FALTANTES O MAL EJECUTADOS Y, EN SU CASO, DEL PAGO EN EXCESO QUE SE HAYA EFECTUADO. IV) DE ACUERDO A LO QUE ESTABLECE EL ARTÍCULO 132 DE EL REGLAMENTO LOS DOCUMENTOS QUE DEBERÁN ACOMPAÑARSE A CADA ESTIMACIÓN SERÁN LOS SIGUIENTES: CARÁTULA DE LA ESTIMACIÓN. RESUMEN DE ESTIMACIONES. ANÁLISIS, CÁLCULO E INTEGRACIÓN DE LOS IMPORTES CORRESPONDIENTES A CADA ESTIMACIÓN. 13 13 EN EL CASO DE ESTIMACIONES DE PRECIOS EXTRAORDINARIOS, ESTAS DEBERÁN IR ACOMPAÑADAS DE LOS OFICIOS DE AUTORIZACIÓN DE DICHOS PRECIOS. V) DE ACUERDO A LO QUE ESTABLECE EL ARTÍCULO 133 DEL REGLAMENTO EN TODOS LOS CASOS EL RESIDENTE DE OBRA DEBERÁ HACER CONSTAR EN LA BITÁCORA ELECTRÓNICA, LA FECHA EN QUE SE PRESENTEN LAS ESTIMACIONES. 8.3 CONDICIONES DE PAGO. EL CONTRATISTA RECIBIRÁ DEL INSTITUTO EL PAGO TOTAL QUE DEBA CUBRÍRSELE POR UNIDAD DE CONCEPTO TERMINADO, EJECUTADO CONFORME AL PROYECTO, ESPECIFICACIONES DE CONSTRUCCIÓN Y NORMAS DE CALIDAD REQUERIDAS, EL CUAL DEBERÁ ESTAR AUTORIZADO Y ACEPTADO POR EL RESIDENTE DE OBRA QUE DESIGNE EL INSTITUTO, COMO SE MENCIONA EN EL ARTÍCULO 54 DE LA LEY. DE ACUERDO A LO ESTABLECIDO EN EL ARTÍCULO 55 DE LA LEY EN CASO DE INCUMPLIMIENTO EN LOS PAGOS DE ESTIMACIONES Y DE AJUSTES DE COSTOS, EL INSTITUTO, A SOLICITUD DEL CONTRATISTA DEBERÁ PAGAR GASTOS FINANCIEROS CONFORME A UNA TASA QUE SERÁ IGUAL A LA ESTABLECIDA POR LA LEY DE INGRESOS DE LA FEDERACIÓN EN LOS CASOS DE PRORROGA PARA EL PAGO DE CRÉDITOS FISCALES. DICHOS GASTOS EMPEZARAN A GENERARSE CUANDO LAS PARTES TENGAN DEFINIDO EL IMPORTE A PAGAR Y SE CALCULARAN SOBRE LAS CANTIDADES NO PAGADAS DEBIÉNDOSE COMPUTAR POR DÍAS NATURALES DESDE QUE SEAN DETERMINADAS Y HASTA LA FECHA EN QUE SE PONGAN EFECTIVAMENTE LAS CANTIDADES A DISPOSICIÓN DE EL CONTRATISTA. TRATÁNDOSE DE PAGOS EN EXCESO QUE HAYA RECIBIDO EL CONTRATISTA, ESTE DEBERÁ REINTEGRAR LAS CANTIDADES PAGADAS EN EXCESO MÁS LOS INTERESES CORRESPONDIENTES, CONFORME A LO SEÑALADO EN EL PÁRRAFO ANTERIOR. LOS CARGOS SE CALCULARÁN SOBRE LAS CANTIDADES PAGADAS EN EXCESO EN CADA CASO Y SE COMPUTARÁN POR DÍAS NATURALES, DESDE LA FECHA DEL PAGO HASTA LA FECHA EN QUE SE PONGAN EFECTIVAMENTE LAS CANTIDADES A DISPOSICIÓN DEL INSTITUTO. NO SE CONSIDERARÁ PAGO EN EXCESO CUANDO LAS DIFERENCIAS QUE RESULTEN A CARGO DEL CONTRATISTA SEAN COMPENSADAS EN LA ESTIMACIÓN SIGUIENTE, O EN EL FINIQUITO, SI DICHO CARGO NO SE HUBIERA IDENTIFICADO CON ANTERIORIDAD. LOS PAGOS SE EFECTUARÁN PRESENTANDO LOS SIGUIENTES DOCUMENTOS: FACTURA ORIGINAL Y CUATRO COPIAS DE LA ESTIMACIÓN DEBIDAMENTE AUTORIZADA POR LA RESIDENCIA DE OBRA DEL INSTITUTO Y CON EL VISTO BUENO DE LA SUPERVISIÓN, ASÍ COMO TRES COPIAS DEL CUERPO DE ESTIMACIÓN. EL LICITANTE GANADOR DEBERÁ FACTURAR CONFORME A LA INFORMACIÓN CONTENIDA EN EL CONTRATO, ESPECIFICANDO NÚMERO DE CONTRATO, EL NÚMERO DE ESTIMACIÓN QUE CORRESPONDA E INDICAR EL PERIODO DE EJECUCIÓN, DICHA FACTURA SE ENTREGARÁ EN EL DEPARTAMENTO DE CONSERVACIÓN Y CONSTRUCCIÓN. DICHOS DOCUMENTOS SE INGRESARÁN EN LA SECCIÓN DE CUENTAS POR PAGAR DEL INSTITUTO, UBICADO EN EL 1ER. PISO DE LA UNIDAD ADMINISTRATIVA, EN CALLE VASCO DE QUIROGA Nº 15 COL. SECCIÓN XVI, C.P , DELEGACIÓN TLALPAN, MÉXICO, D.F., CON UN HORARIO DE ATENCIÓN DE LUNES A VIERNES DE 09:00 A 14:00 HRS., DEBIENDO FACTURAR A NOMBRE DEL INSTITUTO NACIONAL DE CIENCIAS MEDICAS Y NUTRICIÓN SALVADOR ZUBIRÁN, R.F.C. INC710101RH7, DOMICILIO FISCAL: CALLE VASCO DE QUIROGA Nº 15 COL. SECCIÓN XVI, C.P , DELEGACIÓN TLALPAN, MÉXICO, D.F., ESTAS FACTURAS DEBERÁN CUMPLIR CON LOS REQUISITOS ESTABLECIDOS EN LAS LEYES FISCALES APLICABLES; LA CUAL SERÁ PAGADERA EN UNA MENSUALIDAD VENCIDA, EN LA TESORERÍA DEL INSTITUTO, EL DÉCIMO DÍA HÁBIL SIGUIENTE A AQUÉL EN EL QUE EL CONTRATISTA PRESENTE LA FACTURA CORRESPONDIENTE, Y LA CUAL DEBERÁ ESTAR SELLADA POR EL DEPARTAMENTO DE CONSERVACIÓN Y CONSTRUCCIÓN. LAS FACTURAS DEBERÁN CUMPLIR CON TODOS LOS REQUISITOS FISCALES Y ADMINISTRATIVOS VIGENTES, DEBIENDO DARSE DE ALTA COMO PROVEEDOR DEL INSTITUTO PARA REGISTRAR SUS FACTURAS EN EL PORTAL DE PROVEEDORES EN LA PÁGINA WEB MÓDULO DE COMPROBANTES FISCALES, CARGA VALIDACIÓN DE FACTURAS. EL NO REGISTRAR LAS FACTURAS EN LA FORMA SOLICITADA PODRÁ SIGNIFICAR QUE ESTAS NO SEAN PAGADAS, POR LO QUE LA FALTA DE PAGO NO SERÁ RESPONSABILIDAD DEL INSTITUTO. 8.4 EXIGIBILIDAD DE PAGO SE ESTABLECE QUE LA FECHA EXACTA EN QUE SE HARÁ EXIGIBLE LA OBLIGACIÓN DE PAGO PARA EL INSTITUTO, SERÁ PRECISAMENTE AL DÍA SIGUIENTE HÁBIL A LA FECHA DE VENCIMIENTO DEL PLAZO INDICADO EN EL ARTICULO 54 DE LA LEY. 9. ANTICIPOS DE CONFORMIDAD CON LO ESTABLECIDO EN LOS ARTÍCULOS 31 FRACCIÓN IV, Y 50 DE LA LEY, Y 138 DEL REGLAMENTO, EL INSTITUTO OTORGA UN ANTICIPO DEL 10% (DIEZ POR CIENTO), PARA LOS GASTOS DE TRASLADO DE EQUIPO E INSTRUMENTAL CIENTÍFICO; ASÍ COMO PARA LA COMPRA DE INSUMOS NECESARIOS PARA LA PRESTACIÓN DEL SERVICIO. ESTE ANTICIPO SERÁ PUESTO A DISPOSICIÓN DEL CONTRATISTA, MEDIANTE LA PRESENTACIÓN DE LA FACTURA Y PREVIA ENTREGA DE LA FIANZA DE ANTICIPO CORRESPONDIENTE DENTRO DE LOS PRIMEROS 15 DÍAS POSTERIORES AL FALLO Y PREVIO AL INICIO DEL SERVICIO, EN EL CASO QUE EL CONTRATO SEA MULTIANUAL, PARA EL EJERCICIO POSTERIOR O POSTERIORES SE PONDRÁ A DISPOSICIÓN DEL CONTRATISTA DENTRO DEL PRIMER TRIMESTRE DEL SIGUIENTE EJERCICIO, Y EN CUYO CASO DEBERÁ PRESENTAR PREVIAMENTE LA FACTURA Y LA FIANZA CORRESPONDIENTE. LA AMORTIZACIÓN DEL ANTICIPO SE REALIZARÁ DE CONFORMIDAD A LO ESTABLECIDO EN EL ARTICULO 143, FRACCIÓN III, INCISO B) DEL REGLAMENTO. 17 17 ACTO. EL SERVIDOR PUBLICO QUE PRESIDA EL ACTO DEBERÁ RECIBIR LAS PROPOSICIONES PARA SU POSTERIOR EVALUACIÓN, POR LO QUE NO PODRÁ DESECHAR NINGUNA DE ELLAS DURANTE ESTE ACTO. EL ACTO NO PODRÁ CONCLUIR HASTA EN TANTO SE HAYAN ABIERTO TODOS LOS SOBRES RECIBIDOS. 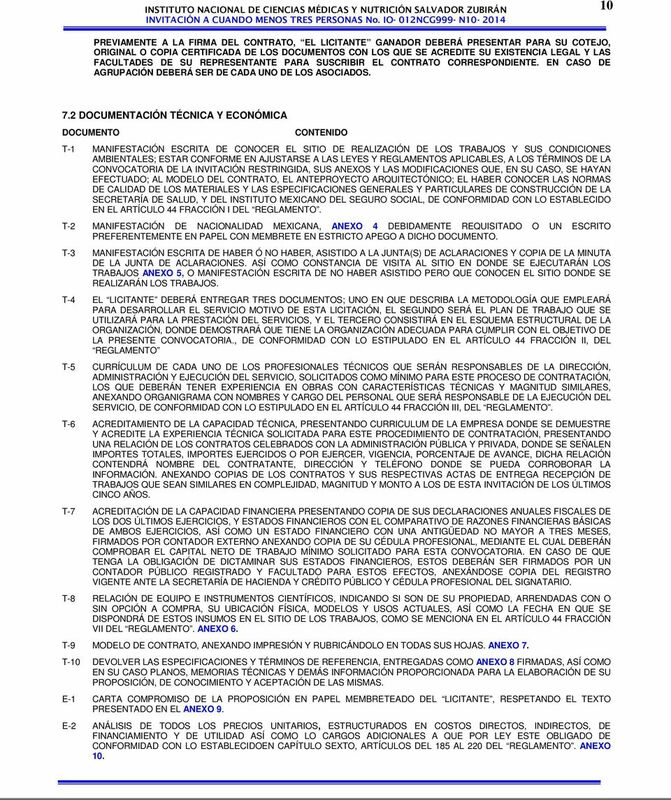 POR LO MENOS UN LICITANTE Y DOS SERVIDORES PÚBLICOS DEL INSTITUTO, RUBRICARÁN EL DOCUMENTO CORRESPONDIENTE AEL CATÁLOGO DE CONCEPTOS,DOCUMENTO E-9 DE LAS PROPOSICIONES ECONÓMICAS. LA CONVOCANTE LEVANTARÁ EL ACTA CORRESPONDIENTE EN LA QUE SE HARÁ CONSTAR EL RESULTADO DE LA EVALUACIÓN CUANTITATIVA DE LAS PROPOSICIONES TÉCNICAS Y ECONÓMICAS ACEPTADAS PARA SU ANÁLISIS CON SUS IMPORTES, ASÍ COMO LAS MANIFESTACIONES QUE, EN SU CASO, EMITAN LOS LICITANTES CON RELACIÓN A DICHO ACTO, Y SE SEÑALARA EL LUGAR, FECHA Y HORA EN QUE SE DARÁ A CONOCER EL FALLO. EL ACTA SERÁ FIRMADA POR LOS ASISTENTES Y SE ENTREGARÁ COPIA DE LA MISMA; LA FALTA DE FIRMA DE ALGÚN LICITANTE NO INVALIDARÁ SU CONTENIDO Y EFECTOS DE ACUERDO A LO ESTABLECIDO EN EL ARTICULO 62 DEL REGLAMENTO. DURANTE EL PLAZO ENTRE ESTA ETAPA Y EL FALLO, EL INSTITUTO HARÁ EL ANÁLISIS CUALITATIVO DETALLADO DE LA DOCUMENTACIÓN LEGAL Y ADMINISTRATIVA, ASÍ COMO DE LAS PROPOSICIONES TÉCNICAS Y ECONÓMICASADMITIDAS. DE ACUERDO CON EL ARTICULO 61, FRACCIÓN III DEL REGLAMENTO, EL SERVIDOR PÚBLICO QUE PRESIDA EL ACTO DEBERÁ RECIBIR LAS PROPOSICIONES PARA SU POSTERIOR EVALUACIÓN, POR LO QUE NO PODRÁ DESECHAR NINGUNA DE ELLAS DURANTE DICHO ACTO. 17. CRITERIOS DE EVALUACIÓN Y ADJUDICACIÓN POR PUNTOS Y PORCENTAJES EL PROCEDIMIENTO Y EL CRITERIO QUE SEGUIRÁ EL INSTITUTO PARA DETERMINAR LA SOLVENCIA DE LAS PROPOSICIONES, Y ADJUDICAR EL CONTRATO AL LICITANTE CUYA PROPOSICIÓN RESULTE MAS CONVENIENTE PARA EL ESTADO SERÁ EL MÉTODO DE PUNTOS Y PORCENTAJES, SUJETÁNDOSE A LO SEÑALADO EN EL ARTÍCULO 38 DE LA LEY, ASÍ COMO A LO ESTABLECIDO EN EL ARTÍCULO 63 FRACCIÓN II DEL REGLAMENTO, Y DE ACUERDO A LOS LINEAMIENTOS EN MATERIA DE ADQUISICIONES, ARRENDAMIENTOS Y SERVICIOS Y DE OBRAS PÚBLICAS Y SERVICIOS RELACIONADOS CON LAS MISMAS PUBLICADOS EN EL DIARIO OFICIAL DE LA FEDERACIÓN EL SEIS DE SEPTIEMBRE DE DOS MIL DIEZ POR PARTE DE LA SECRETARIA DE LA FUNCIÓN PÚBLICA CAUSAS DE DESECHAMIENTO DE LA OFERTA. SERÁ MOTIVO DE DESECHAMIENTO DE UNA OFERTA CUANDO SE OBSERVE LO SIGUIENTE: I. LA FALTA DE INFORMACIÓN O DOCUMENTOS QUE IMPOSIBILITEN DETERMINAR SU SOLVENCIA. II. III. IV. EL INCUMPLIMIENTO DE LAS CONDICIONES LEGALES, TÉCNICAS, ECONÓMICAS Y FINANCIERAS REQUERIDAS POR EL INSTITUTO. SE ACREDITE FEHACIENTEMENTE CON LA DOCUMENTACIÓN IDÓNEA QUE LA INFORMACIÓN O DOCUMENTACIÓN PROPORCIONADA POR LOS LICITANTES ES FALSA. LA UBICACIÓN DEL LICITANTE EN ALGUNO DE LOS PUNTOS SEÑALADOS EN LOS ARTÍCULOS 51 Y 78 PENÚLTIMO PÁRRAFO, DE LA LEY, O QUE SE ENCUENTREN INHABILITADOS POR LA SFP V. SERÁ DESECHADA Y CONSIDERADA COMO NO SOLVENTE AQUELLA PROPUESTA QUE UNA VEZ REALIZADA LA EVALUACIÓN TÉCNICA NO OBTENGA CUANDO MENOS 45 PUNTOS DE LOS 60 PUNTOS MÁXIMOS QUE SE PUEDEN OBTENER DE ESTA EVALUACIÓN. VI. VII. VIII. IX. QUE CONTENGA UNO O VARIOS PRECIOS QUE NO CORRESPONDAN A LA REALIDAD QUE SE OBSERVE DEL LUGAR DONDE SE EJECUTEN LOS TRABAJOS O SERVICIOS. QUE LOS ANÁLISIS DE COSTOS INDIRECTOS, FINANCIAMIENTO Y UTILIDAD, NO SE PRESENTEN CONFORME A LO ESTABLECIDO EN LA LEY Y EL REGLAMENTO. QUE NO HAYA CONSIDERADO LOS CARGOS ADICIONALES QUE POR LEY ESTE OBLIGADO. QUE EL IMPORTE TOTAL DE LA PROPOSICIÓN NO SEA CONGRUENTE CON TODOS LOS DOCUMENTOS QUE LA INTEGRAN X. QUE LOS PROGRAMAS PRESENTADOS NO SEAN CONGRUENTES CON EL PERÍODO DE EJECUCIÓN DE LOS TRABAJOS Y EL PROCEDIMIENTO CONSTRUCTIVO. XI. XII. XIII. XIV. XV. QUE OMITA EN UNO O MÁS CONCEPTOS LA COTIZACIÓN DE LOS INSUMOS REQUERIDOS. QUE LOS PRECIOS PROPUESTOS EN SU OFERTA NO SEAN SOLVENTES CONFORME A LA MAGNITUD Y COMPLEJIDAD DEL SERVICIO. QUE PROPONGA ALTERNATIVAS QUE MODIFIQUEN LAS CONDICIONES ESTABLECIDAS POR EL INSTITUTO EN ESTA CONVOCATORIA, Y CONFORME A LAS CUALES SE DESARROLLARÁ EL SERVICIO. QUE HAYAN COMETIDO HECHOS ILÍCITOS EN PERJUICIO DEL INSTITUTO. QUE NO SATISFAGAN LOS REQUISITOS DE FORMA O DE FONDO DETERMINADOS EN ESTA CONVOCATORIA DE INVITACIÓN. 19 19 Experiencia en asuntos relacionados con la obra objeto de la presente INVITACIÓN Hasta 8 años experiencia De más de 8 años de experiencia Dominio de herramientas relacionadas con la obra a ejecutar b) Capacidad de los Recursos Económicos que la Convocante Considere Necesarios para que el Licitante Cumpla con el Contrato No acredita dominio de herramientas Acredita dominio de herramientas Recursos económicos del licitante. Capital neto de trabajo Mínimo solicitado De más de 2 veces el solicitado c) Participación de Discapacitados o Empresas que Cuenten con Trabajadores con Discapacidad Sin personal discapacitado 0.25% por cada persona discapacitada que acredite d) Subcontratación de MIPYMES Se asignarán puntos a las empresas que decidan subcontratar parte de los trabajos Al que no contrate con MIPYMES, conforme a la siguiente tabla MIPYMES Para asignar los puntos o unidades porcentuales que corresponda, se deberá anexar el documento expedido por autoridad competente o el escrito a que se refiere el segundo párrafo del artículo 12 del Reglamento. Al que contrate el mayor número, el resto por regla de tres simple I.B) EXPERIENCIA Y ESPECIALIDAD DEL LICITANTE a) Experiencia de la Empresa 9.00 Se calificará la experiencia de la empresa en obras similares con base a la empresa que tenga más tiempo ejecutando servicios similares (en monto o magnitud) a las objeto de la convocatoria, a quien se le asignará la mayor puntuación y al resto en forma porcentual, con base en una regla de tres, tomando como período de evaluación los últimos cinco años. b) Especialidad de la Empresa 9.00 Se asignará la mayor puntuación o unidades porcentuales al licitante que demuestre documentalmente el mayor número de contratos o documentos con los cuales el licitante pueda acreditar que ha ejecutado servicios con las características, complejidad y magnitud especificas y en condiciones similares a la establecida en la presente convocatoria, en los últimos cinco años, al resto de los licitantes se les asignará puntuación o unidades porcentuales de manera proporcional, con base en una regla de tres. I.C) PROPUESTA DE TRABAJO Metodología para la prestación del servicios Se revisará que la metodología propuesta por el licitante sea congruente con el Suficiente Sobresaliente servicio que se va a prestar. Plan de Trabajo Se evaluará el plan de trabajo propuesto por el licitante a efecto de poder cumplir con Pobre y poco Detallado y claro en los alcances de la convocatoria detallado razón del servicio Esquema estructural de la Organización Se revisará el organigrama propuesto por el licitante, y que tenga el personal suficiente para desarrollar el servicio en función de la metodología propuesta y el plan de trabajo presentado. Personal insuficiente y pobre esquema organizacional Personal suficiente y buen esquema organizacional I.D) CUMPLIMIENTO DE CONTRATOS 6.00 Se asignará la mayor puntuación o unidades porcentuales al licitante que demuestre documentalmente tener más contratos cumplidos satisfactoriamente en términos del Reglamento de la Ley de Obras Públicas y Servicios Relacionados con las Mismas, a partir del mínimo establecido en la convocatoria en los últimos cinco años, al resto de los licitantes se les asignará puntuación de manera proporcional al número de contratos que acrediten haber cumplido. En caso de no presentar el mínimo de contratos requeridos, no se le asignará puntuación o unidades porcentuales EVALUACIÓN ECONÓMICA. RUBRO: SUPERVISIÓN PARA EL CONTROL DE LA OBRA DE DRAGADO DE MANTENIMIENTO DEL CANAL DE NAVEGACIÓN DE ACCESO EN BOCA DEL RÍO, VER. ACTIVIDAD INICIA TERMINA HORARIO Publicación en Internet de las Prebases para comentarios sobre las mismas. 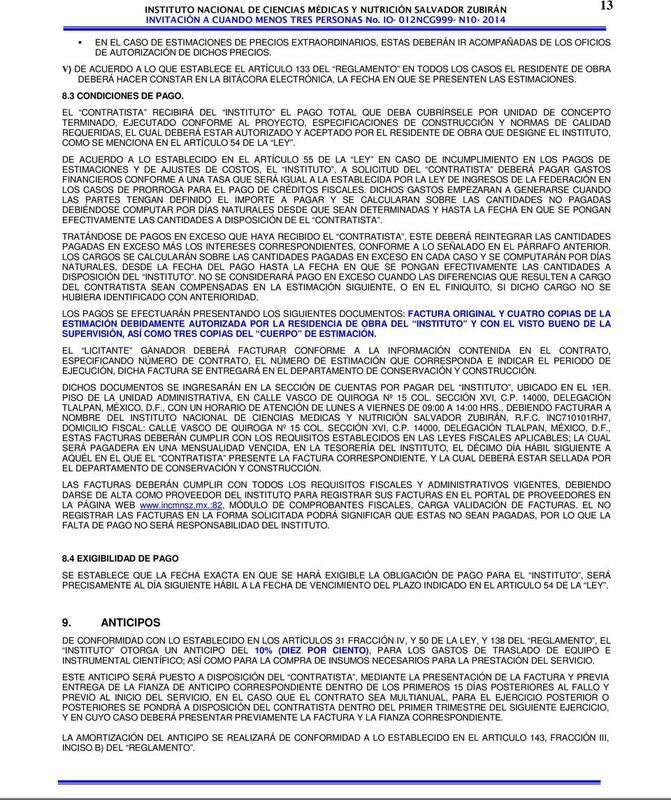 Publicación de la convocatoria. 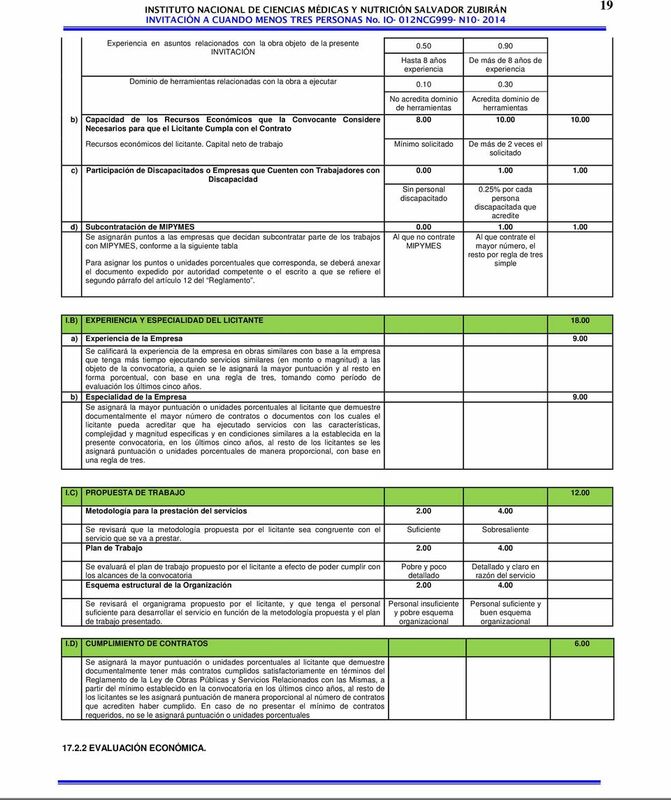 Manual para la Administración de Proyectos del Fondo Sectorial de Innovación Secretaría de Economía-CONACYT (FINNOVA). FALLO CORRESPONDIENTE A LA LICITACIÓN PÚBLICA NACIONAL NO. BM-SAIG-446-14-1, RELATIVA A LA CONTRATACIÓN DE DIVERSOS TIPOS DE SEGUROS. FALLO. 1) Leobardo Campero Herrera; 2) Grupo Alpha Simet, S.A. de C.V.; 3) Comercializadora Isatam, S.A. de C.V.; 4) Beard, S.A. de C.V.